Amy here, reporting a drink, or really a light summer meal, which turned into a backyard party. My sister Laura was so inspired, and we benefited. The photos and recipes are hers. Thank you!!!!! 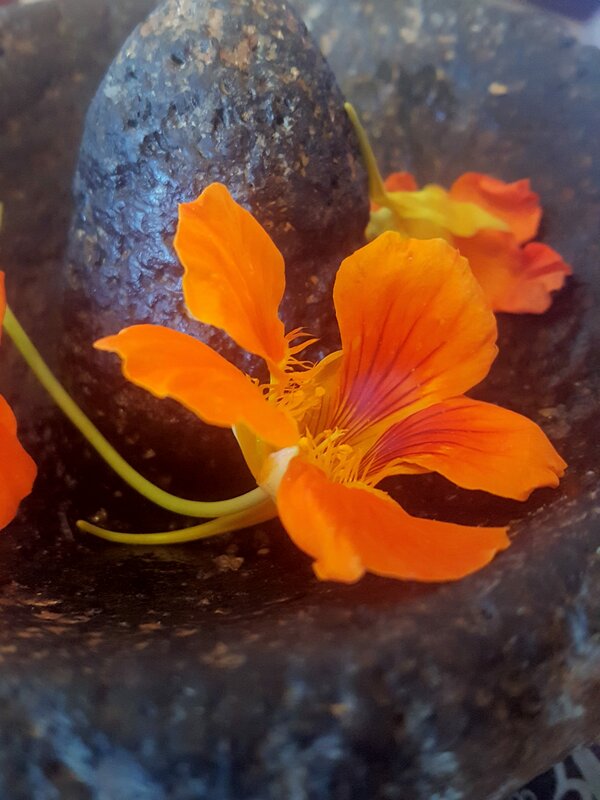 We both love Pipián Picante, and so that’s the mole powder she used, but other Mano y Metate varieties would be great, so use what you have and what you like. 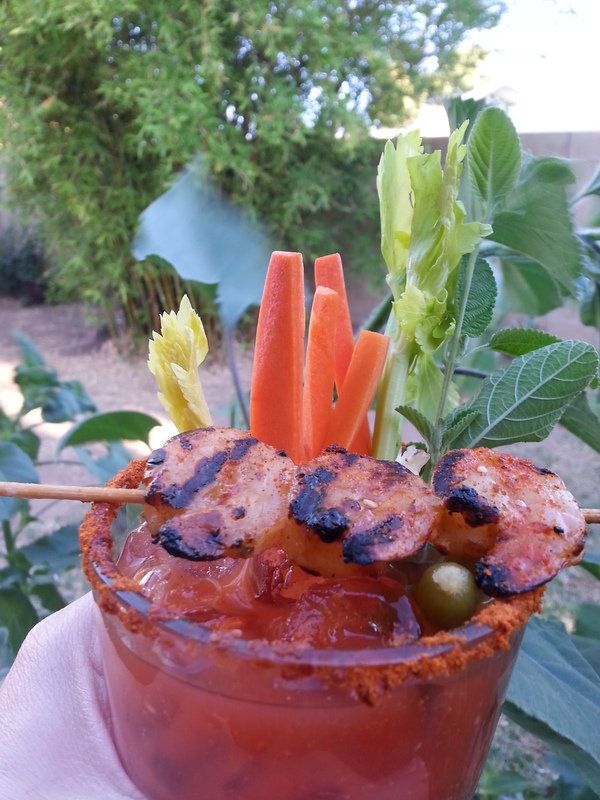 Add a pinch of mole powder to your favorite Bloody Mary (vodka) or Maria (tequila) recipe, with or without the alcohol. Laura’s recipe is at the bottom of this page. Then rim the glasses with the mole powder as well. 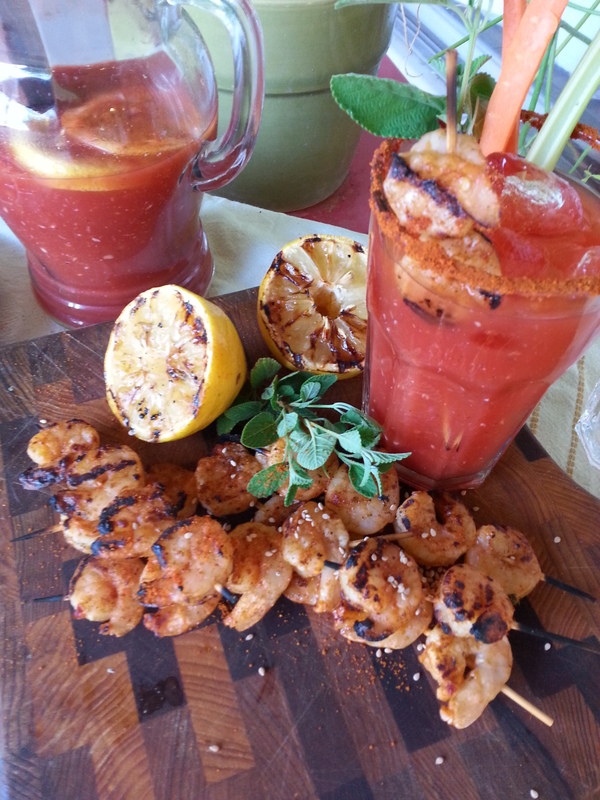 Finally, garnish the drink with skewers of grilled shrimp, marinated with mole powder, crunchy veggies and a sprig of Mexican oregano. This grilled shrimp cocktail serves four as an appetizer. For a light summer meal, serve more shrimp skewers per person and a salad. Start by soaking bamboo skewers in water. Marinate shrimp for at least 15 minutes. 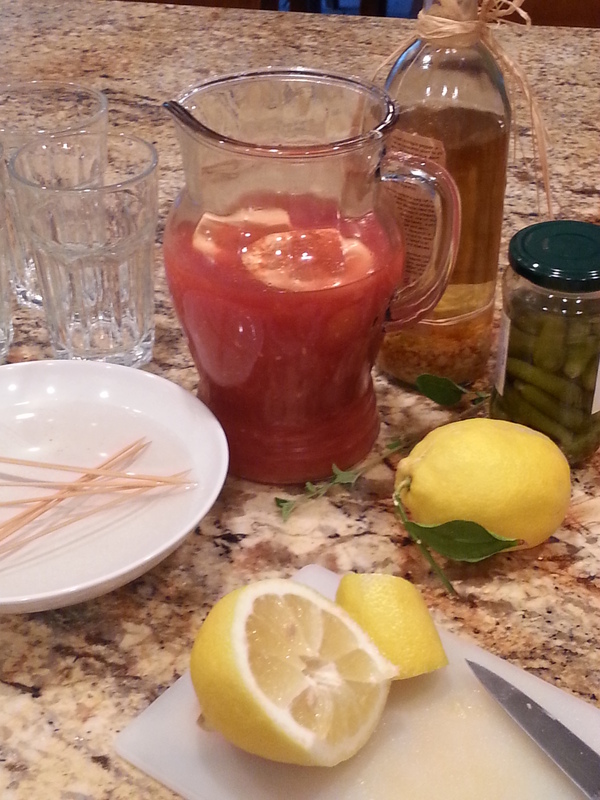 While the shrimp marinate, make bloody Mary mix. Start the grill and cook the shrimp and lemon. Next, wet the rims of the serving glasses with lemon juice, then dip into mole powder. Top the grilled shrimp with a squeeze of the grilled lemon, another pinch of mole powder and sesame seeds. 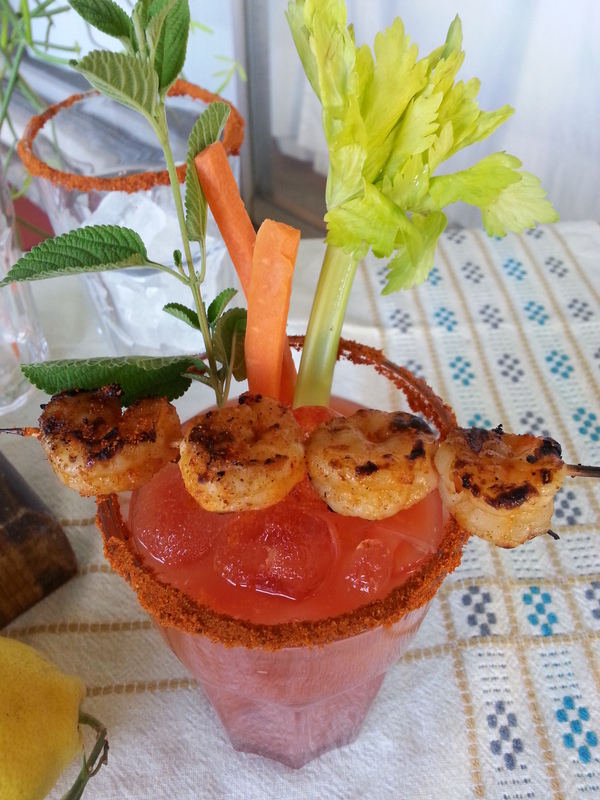 Assemble the drink, add garnishes, and top with shrimp skewers. At sunset, take outside and enjoy! 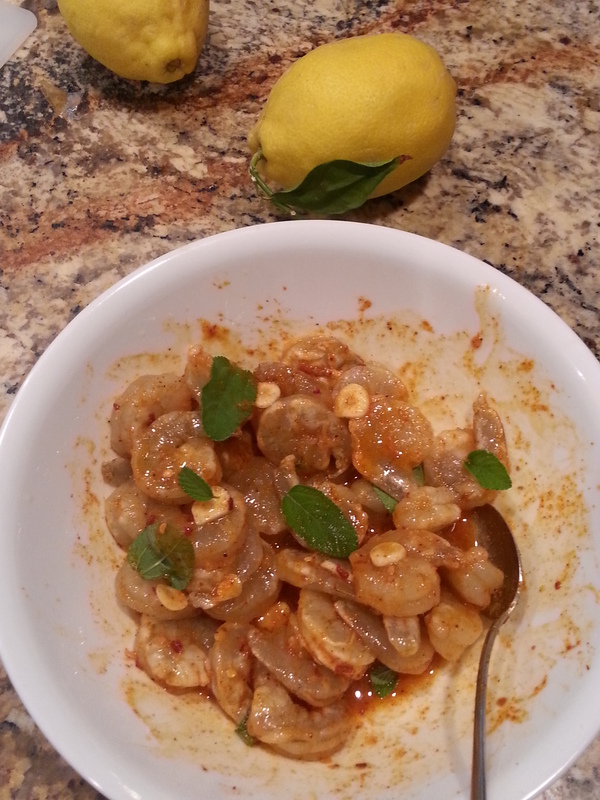 Place shrimp in bowl with oil, sliced garlic, oregano, mole powder, lemon juice, agave, crushed red chile, salt and pepper. Mix to evenly coat shrimp and chill. Marinate for a minimum of 15 minutes, but not longer than an hour or the shrimp turn opaque from the acid in the lemon juice. Place shrimp on skewers (3-4 per skewer) and grill turning once, for 3 minutes per side. 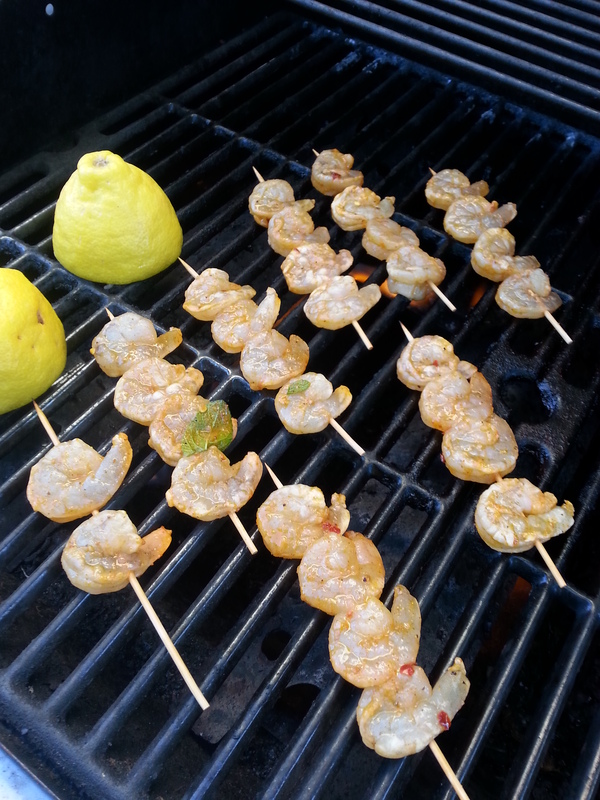 Grill lemon halves along with shrimp. Once cooked, remove the shrimp from the grill, squeeze roasted lemons over the skewers and sprinkle with remaining mole powder and toasted sesame seeds. This mix gets better with time, and it is even better made the day before. 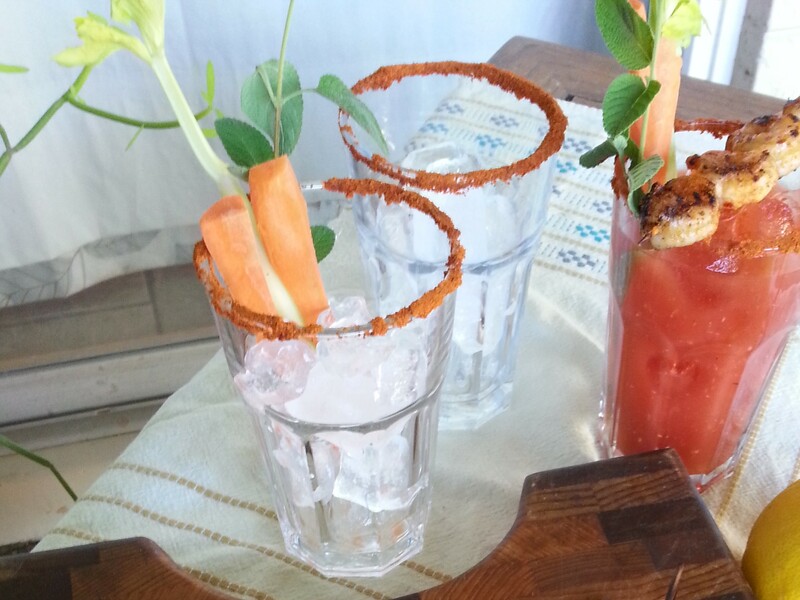 You can also use your favorite pre-made mix and experiment with garnishes. Add all of the ingredients for the drink mix (reserving some mole powder and all of the optional garnishes for later) and chill. To prepare the glasses, place mole powder on a shallow plate. Wet the rim of the glass with either water or lemon juice, and dunk into the powder. Set aside. Once the drink mix is ready to serve, place ice into glass first (being careful not to knock off the mole powder from the rim). Fill the glass with the mix and add your favorite garnishes. 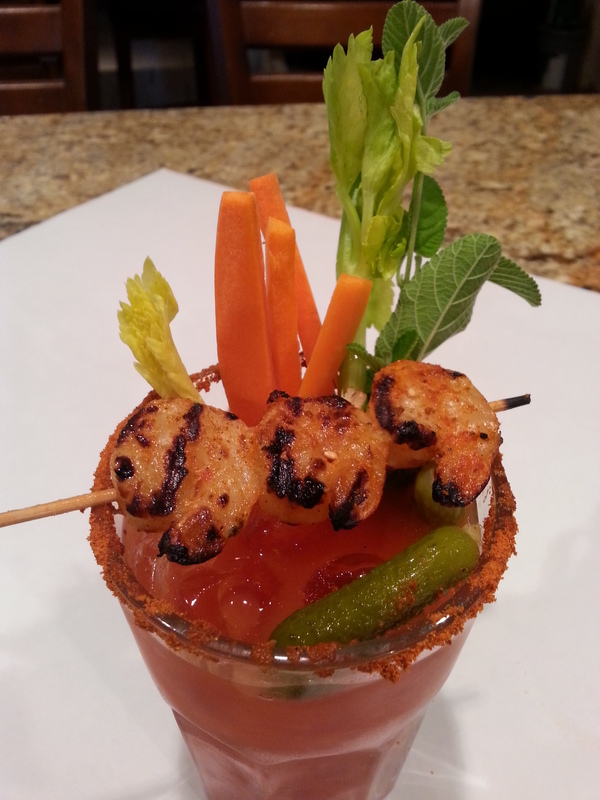 Top the glass with a shrimp skewer and enjoy! EVERYTHING-LOCAL PIZZA from Baja Arizona! 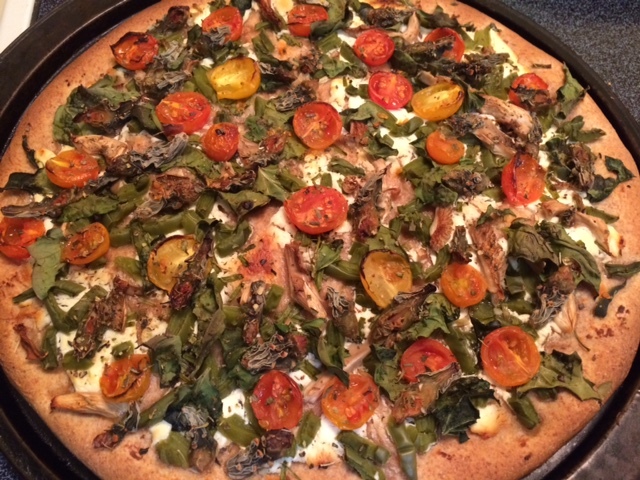 If you love pizza–and I’m picky about good pizza–here are some ways to celebrate local foods, to eat super-healthily, get creative in the kitchen, AND have new excuses to eat pizza! 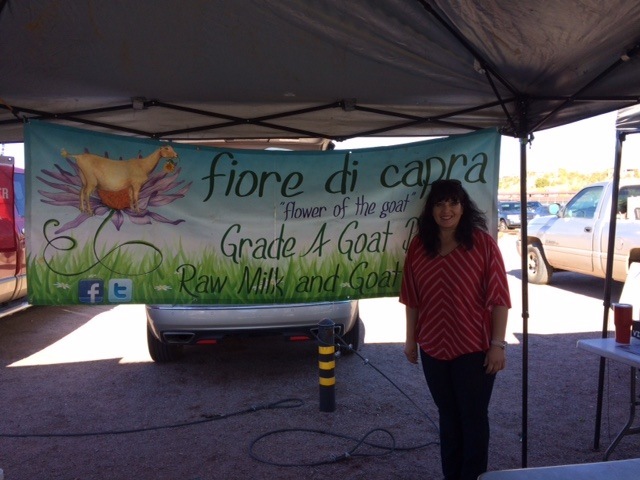 Tia Marta here to share ideas for a delicious pizza party, incorporating the fabulous gifts that our local desert foods offer. 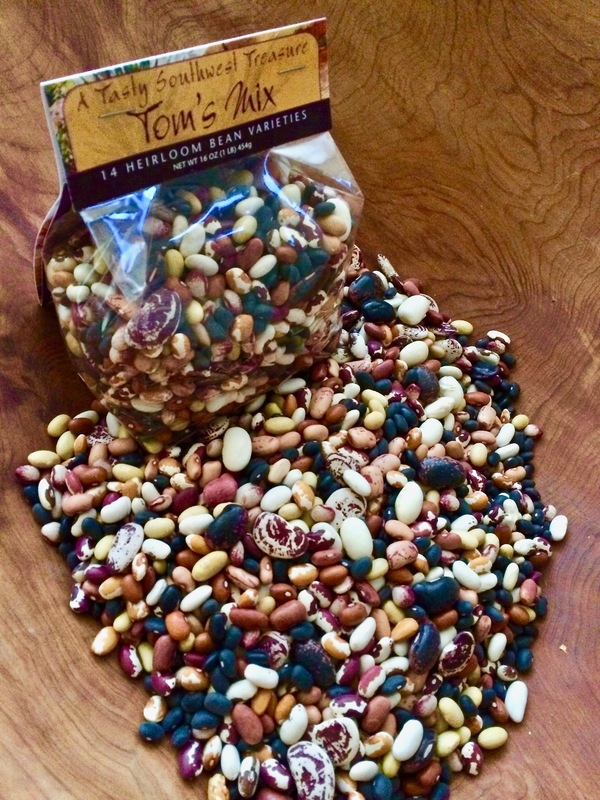 It will take a little fore-thought and assembly time (…like, all year harvesting at the right seasons for DIYers, or trips to the farmers market, NativeSeeds/SEARCH store, or San Xavier Farm Coop). 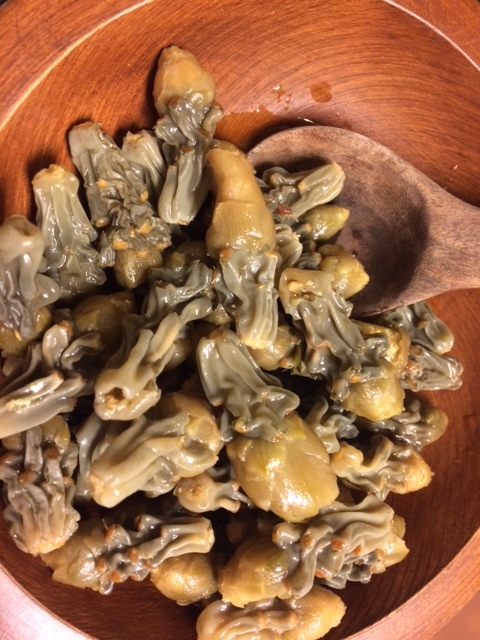 Cholla buds dried from last April’s harvest, soaked and simmered until soft through, make a tangy taste surprise– a super-nutritious calcium-packed pizza topping. In the photo, the larger buds are from Buckhorn cholla (Cylindropuntia acanthacarpa) and the smaller buds are from Staghorn (C. versicolor), both plentiful for harvesting in low desert. 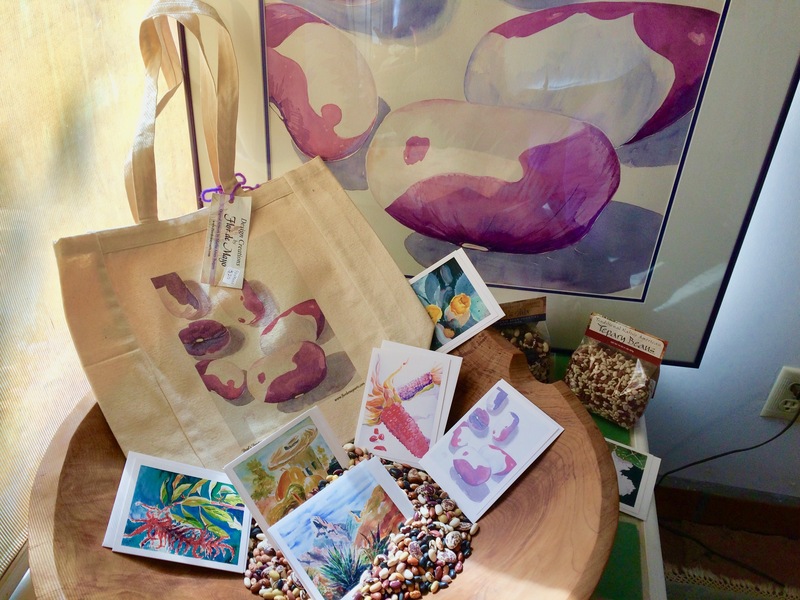 Dried cholla buds are available at San Xavier Coop Association’s farm outlet, at NativeSeeds/SEARCH store, and at http://www.flordemayoarts.com. 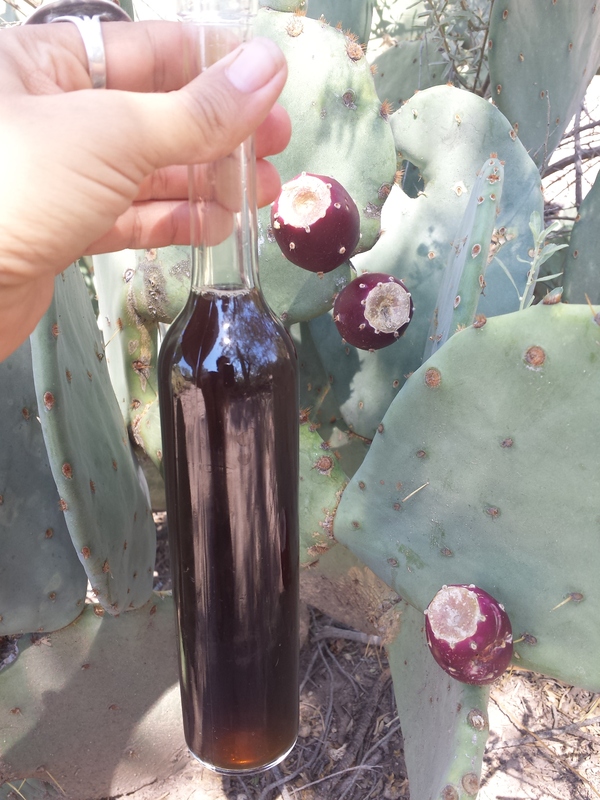 Another perfect topping is nopalitos, simmered or pickled and diced young pads of our ubiquitous prickly pears (Opuntia engelmannii, O.ficus-indica to name a couple). 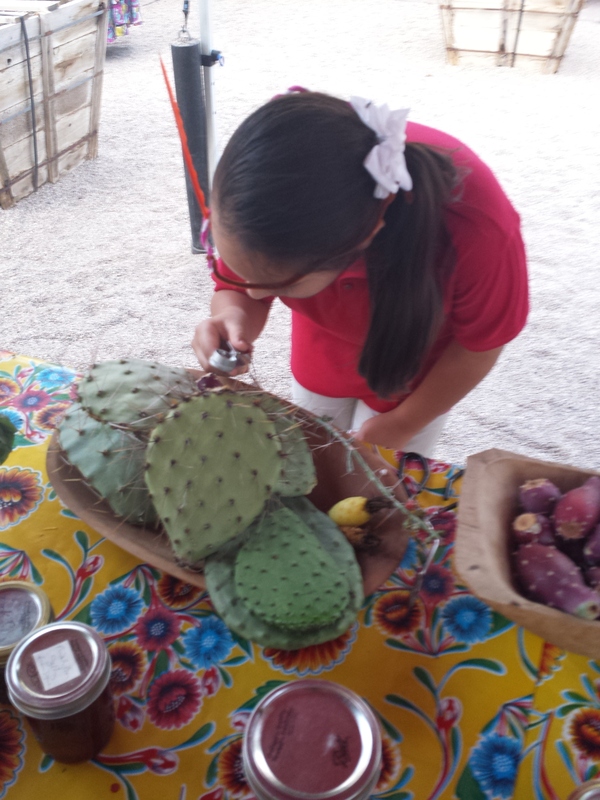 Collecting from the desert is a spring activity, but you can easily find whole or diced nopales anytime at Food City. The other cheater’s method is to find canned pickled cactus in the Mexican food section of any local grocery. 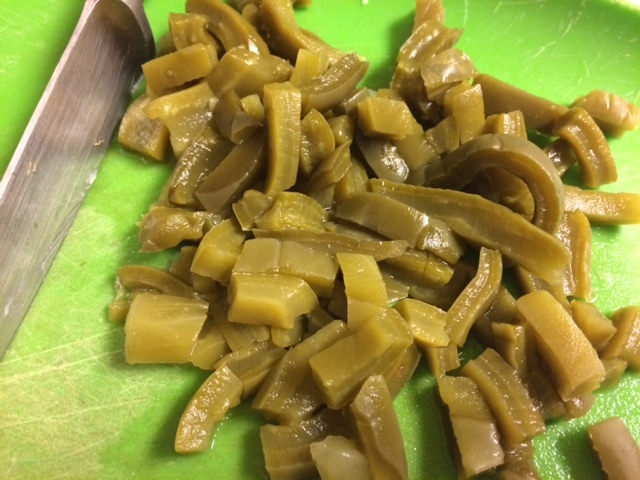 Nopalitos are a taste thrill on a pizza, and you can enjoy their blood-sugar balancing benefits to boot. As for making the crust, we have the perfect source of the freshest whole grain organic flours right here from BKWFarms’ fresh-milled heirloom white Sonora & hard red wheat. Heat water and pour into a large mixing bowl. Test for temperature then dissolve dry yeast. Add honey and sea salt and dissolve both. Add oil to wet mixture. Sift flours. 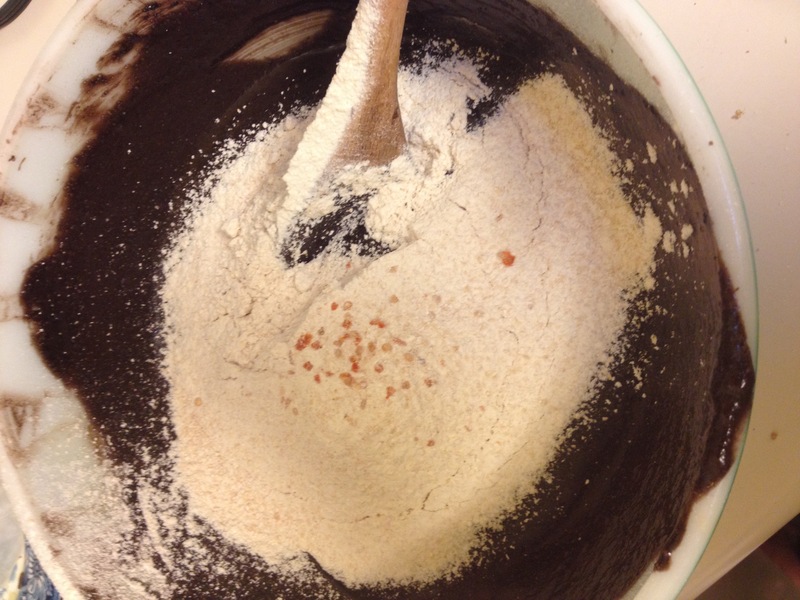 Gradually mix flours into wet ingredients until a mass of dough is formed and begins to pull away from sides of bowl. Knead into a ball. 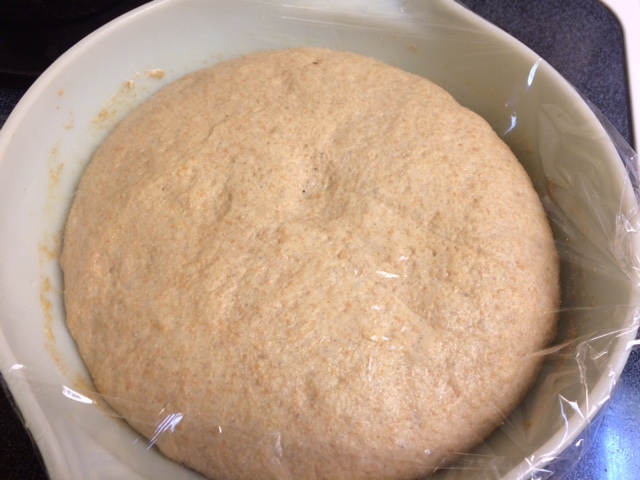 Let stand covered in a warm place until ball of dough has at least doubled in size (approx 2 hours). Knead the ball again, divide into 2 equal parts, cover thinly with the additional olive oil, and roll out or hand-flatten the 2 dough balls out onto 2 oiled pizza pans. 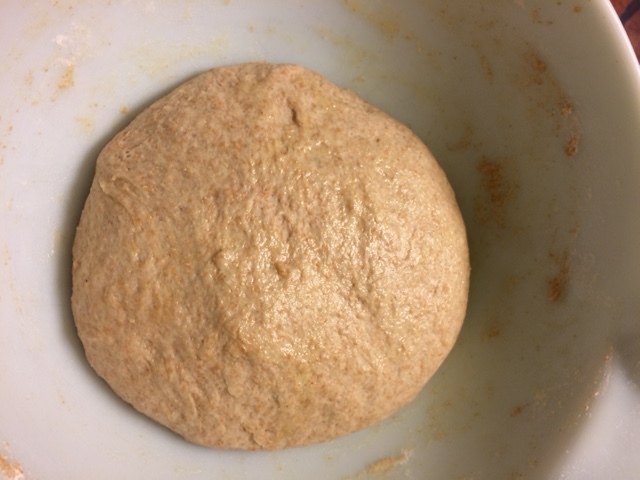 Pat dough to approximately 1/4″-3/8″ thickness to the edges of pan. At this point you are ready to add any number of good toppings. 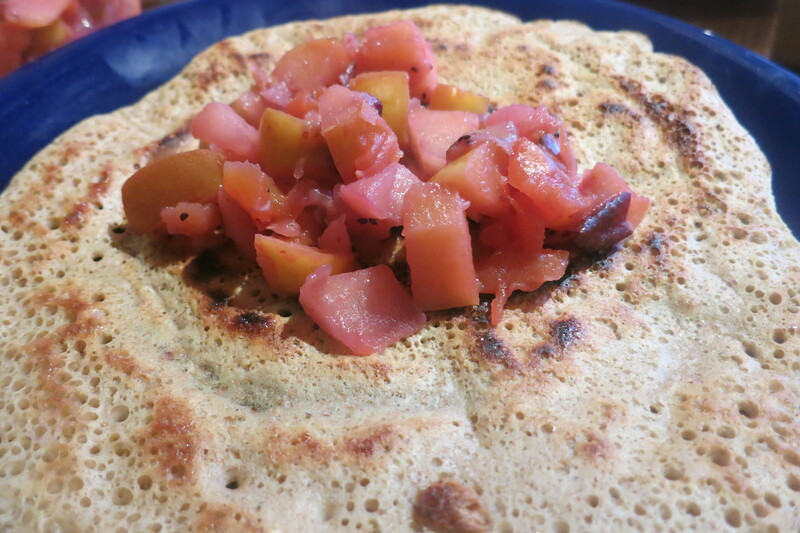 Here are ideas for a local veggie and a local meatie pizza. 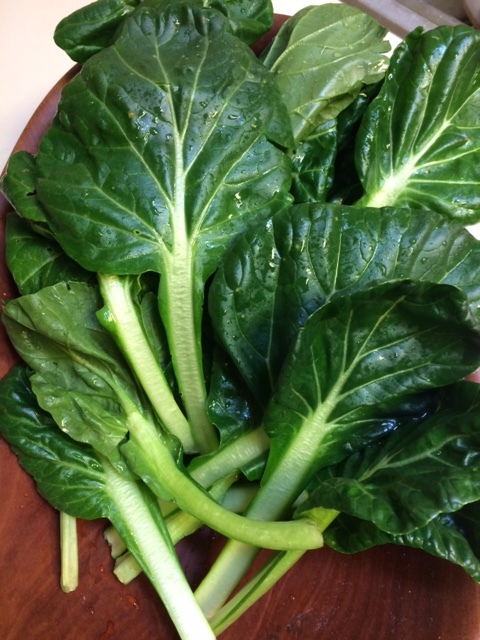 Fresh Chard (acelgas) from a refugee friend’s garden–a great substitute for spinach in a pizza! Layer your toppings artfully, beginning by spreading the goat cheese evenly over the patted-out crust dough. 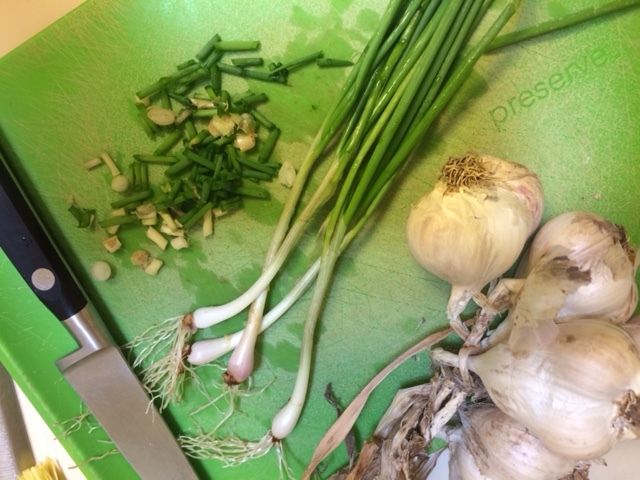 For a local Veggie Pizza, scatter minced garlic and chopped I’itoi’s onions evenly atop the goat cheese layer. Place torn leaves of fresh acelgas over the onion/garlic layer. Add sliced tomatoes, sliced mushrooms, sliced cholla buds, diced nopalitos. Top with optional salsa. For a Cholla&Chorizo Meatie Pizza, do a similar layering beginning with goat cheese spread over the crust dough, then scattered I’itoi’s onions and garlic, then a full layer of cooked chorizo, and topped by lots of sliced cholla buds. Adding salsa over all is optional for making a juicier pizza. Preheat oven to high 425 degrees F. Bake both pizzas 20-24 minutes or until the crust begins to turn more golden. You won’t believe the flavor of the crust alone on this local pizza–and the delicious toppings grown right here in Baja Arizona are better than “icing on the cake”! You can add more spice and zing by crushing our native wild chiltepin peppers on your pizza–but be forewarned–they might blow your socks off. 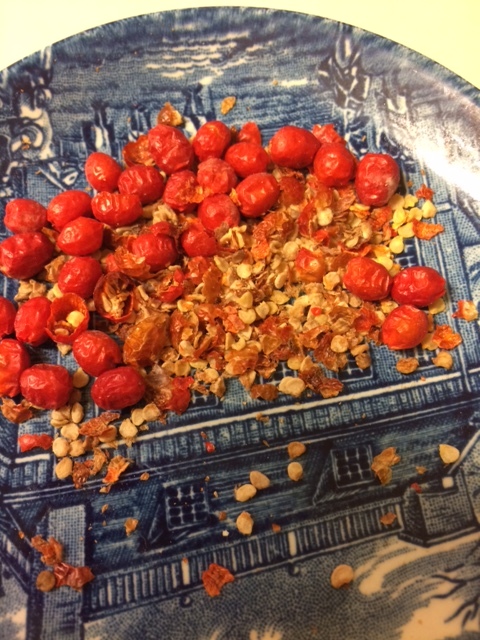 Home-grown chiltepin peppers from my garden, dried, crushed and ready to spice up a local pizza–Look out for a wave of picante heat even with a small pinch! Here’s wishing you a great local pizza party! How could you top this Baja Arizona Pizza?!!! 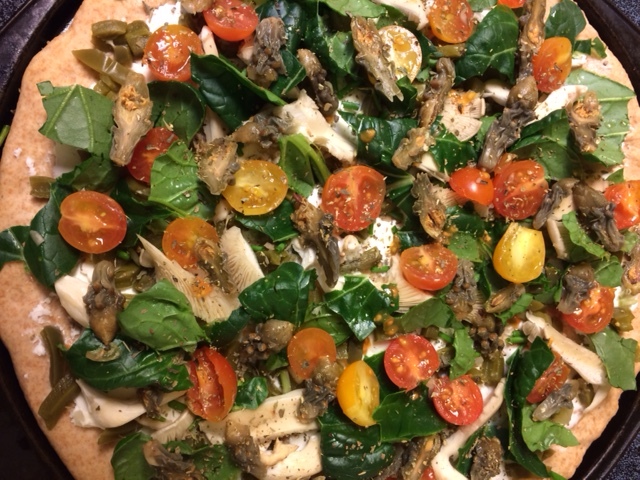 Our locally grown and wild desert-harvested ingredients can’t be beat by any other veggie pizza! 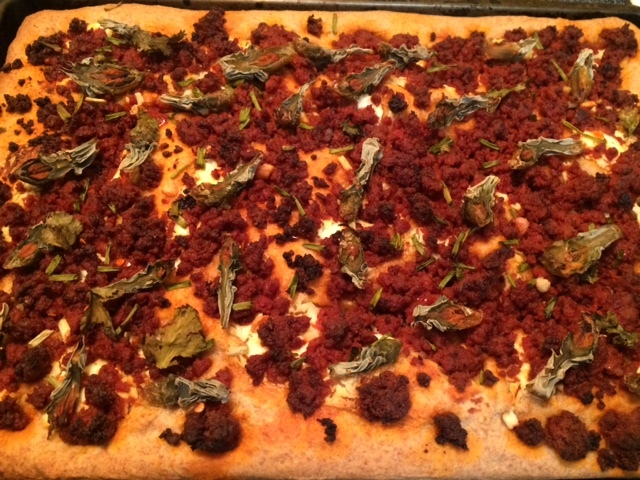 What a great combination–wild-harvested cholla buds, local chorizo, Fiore di Capra goat cheese, and truly flavorful organic wheat flour crust! Buen provecho from Tia Marta! See you when you visit http://www.flordemayoarts.com. Black Teparies Make a Come-Back! In some light they are a dull charcoal difficult to spot if the pods shatter onto the ground. Sometimes they appear shiny black or opalescent. Somehow black teparies appear to have an antiquity about them–mysteriously harking back to a time rich in prehistory. 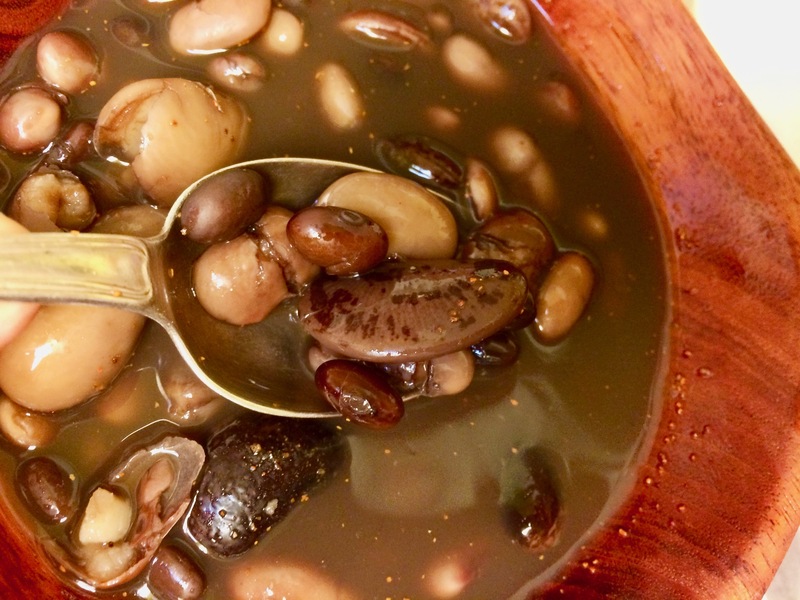 Tia Marta here to tell you a little about the black tepary bean’s odyssey back into cultivation and into the cooking pots of Southwesterners once again. The neat thing about cultivars that are still genetically close to their wild ancestors is that they still contain a diversity of genes that can “pop out” occasionally as visibly different seeds. 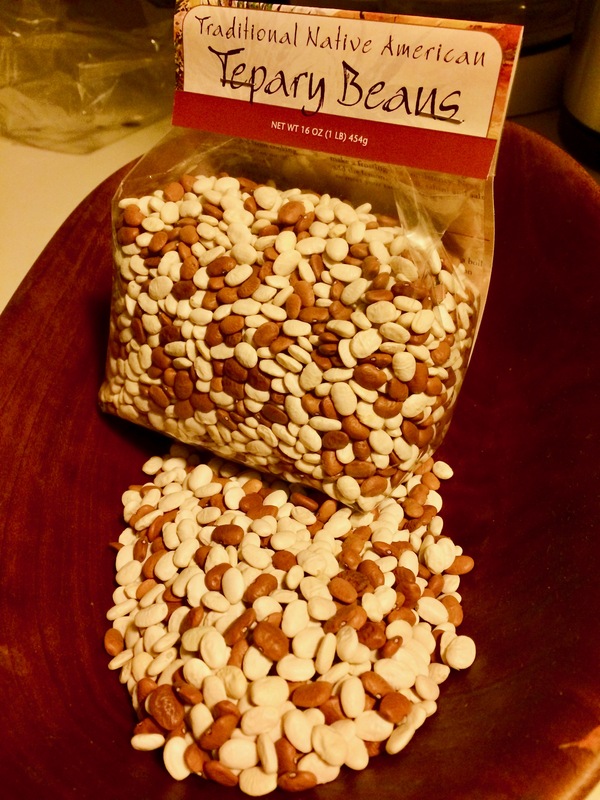 In the case of the teparies, every so often in a harvest of white teparies, for example, there may turn up a few coral pink, or blue speckled, or even black beans. 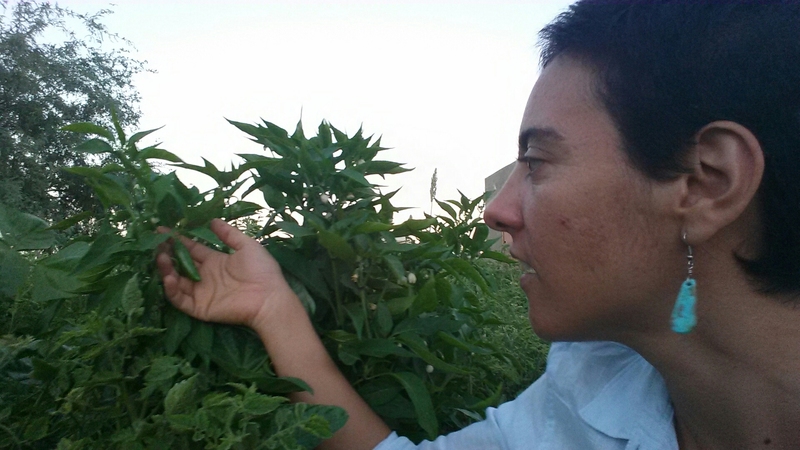 At the University of Arizona’s Maricopa Experimental Farm, an amazing crop researcher, Mike Sheedy, was, for several years growing teparies to isolate some of these genetic “sports”. He used assistance from his kids (In farming, child labor rules just can’t apply) to help pick out the odd-ball seeds from hundreds of pounds of harvested teparies. Over the years, he grew the separated colors in isolation from each other to preserve color purity. Before research funds ran out he had “re-created” an ancient lineage of black teparies—i.e. he has assisted the ancient genes to come again to the fore, to bring the “invisible” genotype back into the “visible” phenotypes. At termination of his research project he generously donated the black tepary collection to the traditional Pima farming family of Ramona and Terry Button. Now—tah-dah!—at last black teparies are in agricultural production on ancestral lands! The public can purchase these little food gems of antiquity now at the NativeSeeds/SEARCH store (3061 N Campbell Ave, Tucson) www.nativeseeds.org , at the Flor de Mayo booth at Sunday St Philips Farmers Market www.flordemayoarts.com , or online via www.ramonafarms.com. 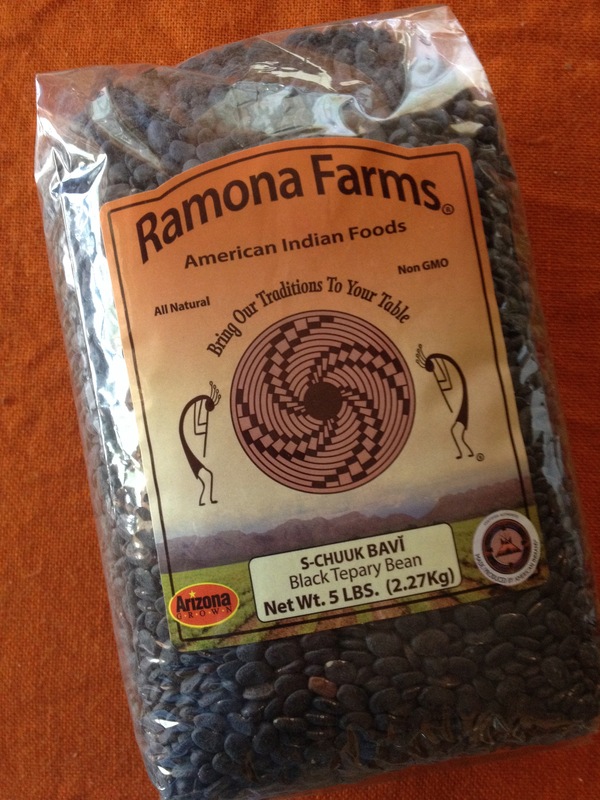 Black teparies are very different in taste from the red or white teparies—although all teparies are much richer than their more distant cousins like the common bean, lima or black-eye pea. Black tepary, schkug ba:wĭ of the Tohono and Akimel O’odham, is the deepest, nuttiest of all, with an earthy bouquet and a slightly bitter after-note reminiscent of coffee. Well, you will just have to try your own taste buds on them! 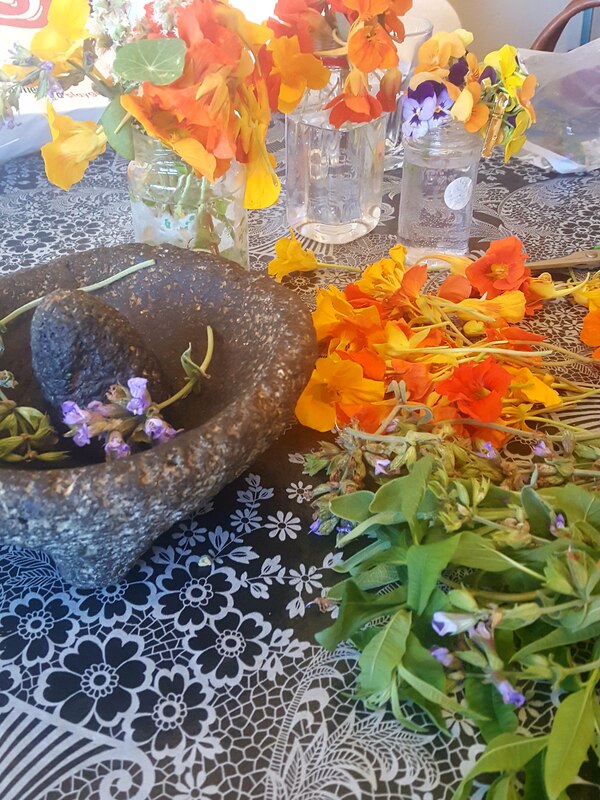 All of the heirloom foods served at the Farm to Table Picnic are being grown (even as I write) locally in Baja Arizona, either at the NativeSeeds/SEARCH Conservation Farm in Patagonia, or at the Mission Garden itself, or by sponsoring farmers and ranchers such as BKWFarmsInc, the 47-Ranch, and Ramona Farms. Some of Tucson’s best chefs are donating their skill and time to prepare different dishes for us. 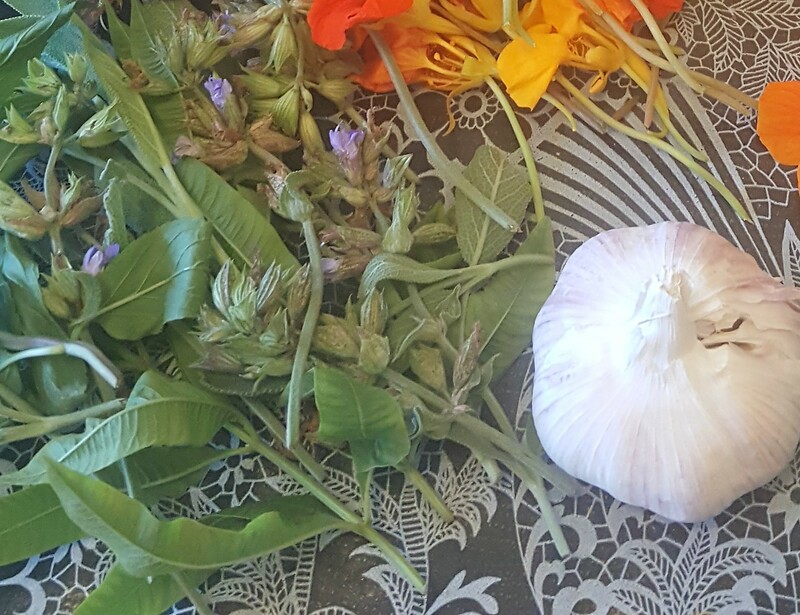 It will be a great opportunity to put the fun in fundraising for two worthy local non-profits, to share the delicious tastes of our heirloom foods of the Borderlands, and to share community joy in what we are able to produce together locally. For adventuresome cooks, dessert addicts, and chocoholics, I would like to share two variations on brownies made with—yes, you guessed it—black tepary beans! You will not believe how yummy these are. First, cooking black teparies (as with all teparies) takes some time—and premeditation. The day before you want to use them, sort, wash, and pre-soak your black teparies. I hit them with a quick boil and let them sit overnight to hydrate slowly. Change the water the next day, adding fresh drinking water. Simmer until soft (it may take 2-3 hours on stovetop or 4-6 in crockpot). You want them beyond al dente in order to puree them in a blender or CuisinArt for the following recipes. Preheat oven to 350 degrees F. Grease an 8×8” baking dish and place a wax paper cut to fit the bottom of pan. Melt butter (preferably in top of double boiler). Stir in thoroughly 5 Tbsp dark unsweetened cocoa powder. Let the mixture cool. Add sugars and sea salt to mixture and beat until creamy. Add vanilla. Beat 4 eggs and add to mixture stirring until uniform in color. Add 1 cup pureed black teparies and hand-mix. Pour batter into greased bake pan. Sprinkle top of batter with pinyones or other nutmeats. Bake 45-50 minutes until it tests done with toothpick. Cool pan on a rack. 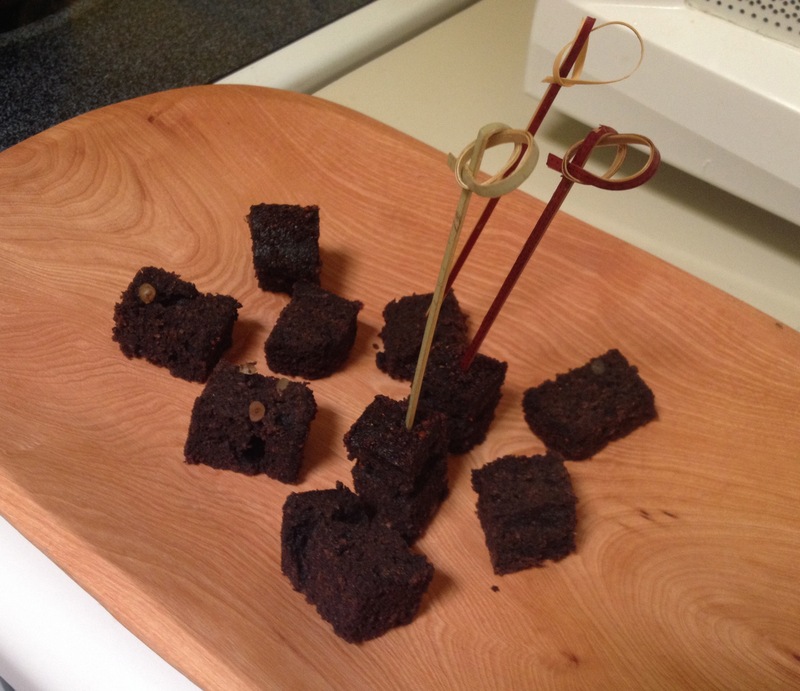 Cut in small squares to serve because it is so rich and moist. Enjoy their delicious flavors AND the healthy qualities of high protein/high complex carb teparies, protein-rich eggs, and the benefits of dark chocolate! 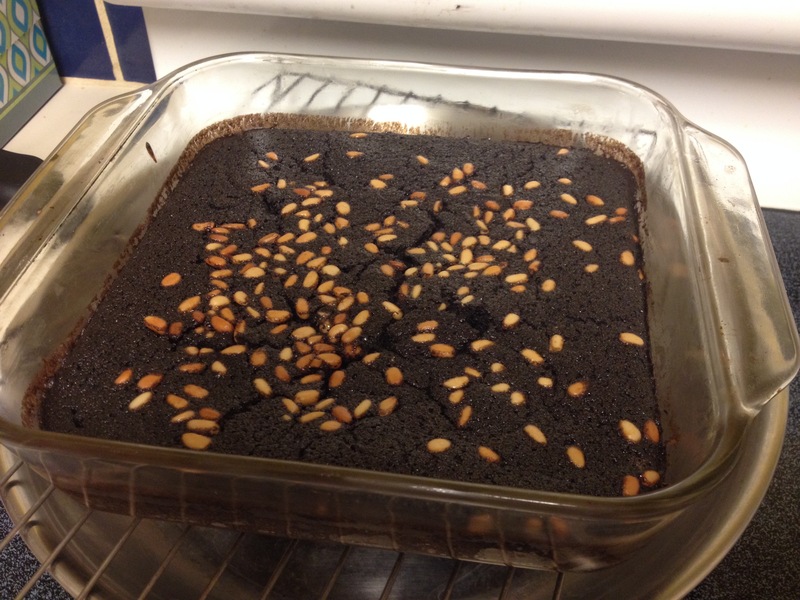 Gluten-free Black Tepary Brownie-Cockaigne ready to eat–wheat-free, light, nutritious and delicious! 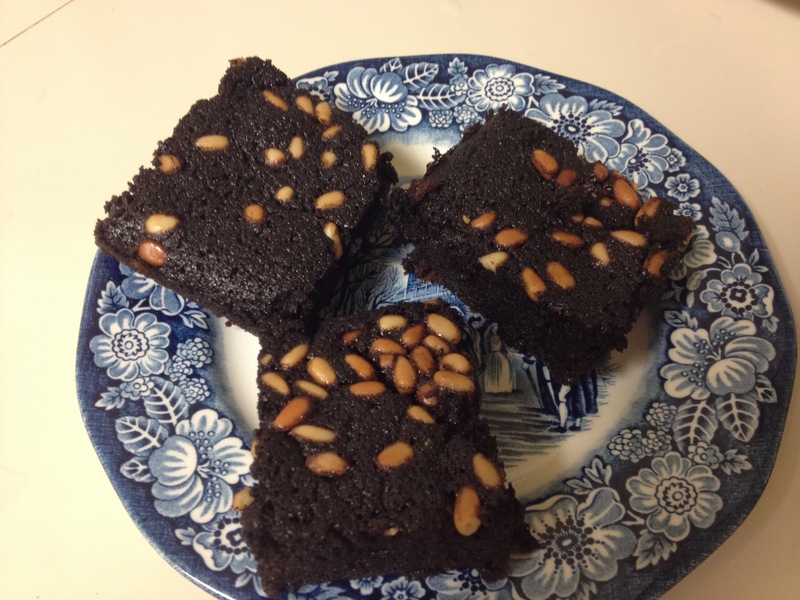 My next black tepary brownie recipe was first inspired by food-writer and “Blog-sister” Carolyn Niethammer’s recipe found in her book Cooking the Wild Southwest (p.133)–a must-have in every SW cook’s kitchen shelf. 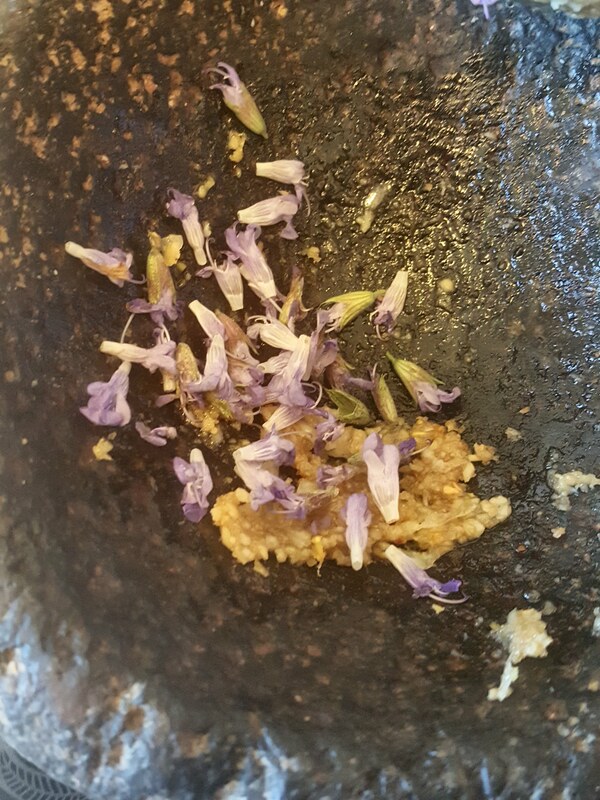 Here I’ve made some interesting gastronomic additions…including the use of our fantastic local heirloom White Sonora Wheat flour, crushed wild chiltepines, and Mano y Metate’s fresh-ground Mole Dulce powder produced by our local Molera herself, Amy Valdes Schwemm. ** Freshly milled White Sonora Wheat is available at our Flor de Mayo booth, Sunday’s St Philips farmers market (www.foodinroot.com). 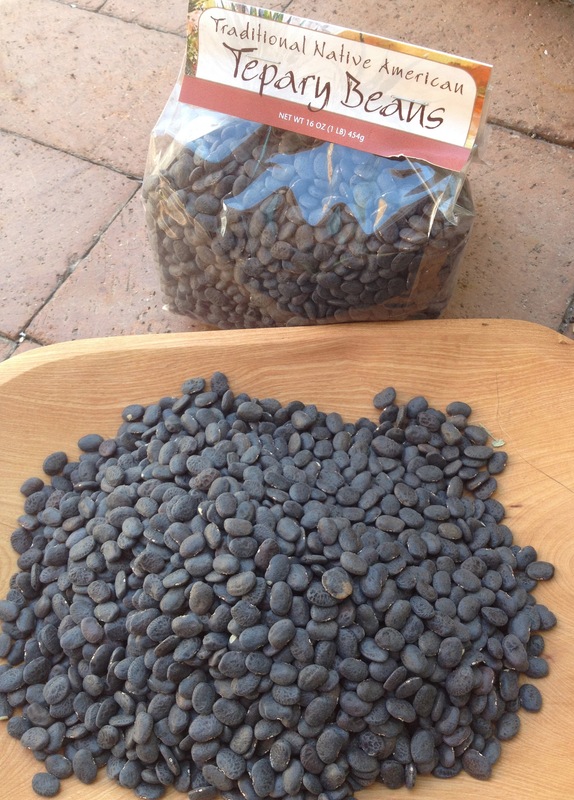 Call ahead for quantities larger than 1 kilo—520-907-9471. ***whole wild-harvested Chiltepines are available at the NSS Store, 3061 N Campbell, and at Flor de Mayo booth, Sunday St Philips farmers mkt. 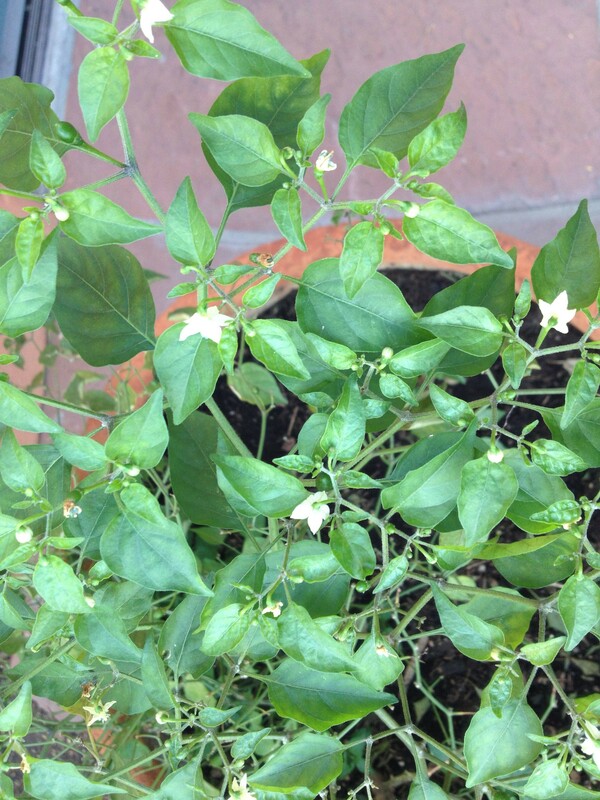 Chiltepin plants to grow can be purchased at NSS plant sales. “Hot-dam” Black Tepary Brownies ready to enjoy! 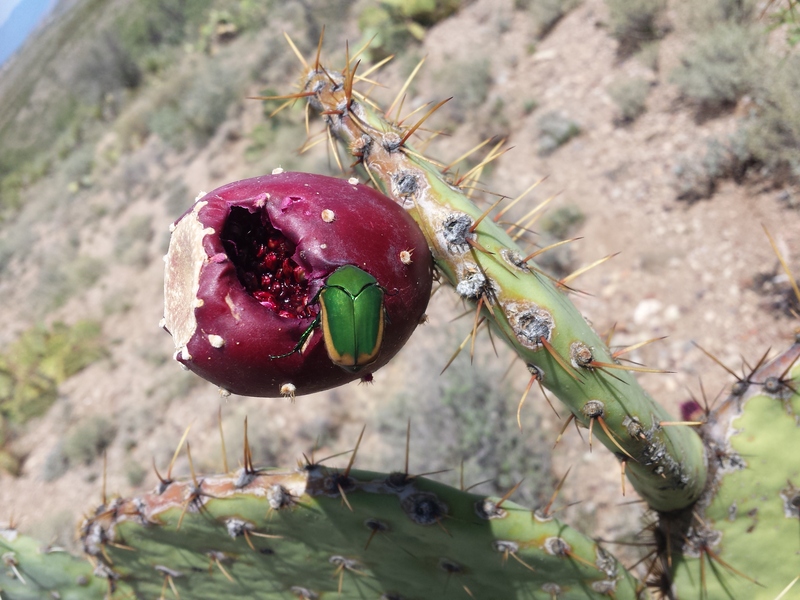 Tia Marta is hoping you enjoy these fruits and flavors of the Sonoran Desert assisted by fruits of tropical North America—a marriage made in dessert-Heaven! With every bite we should be thanking ancient tepary farmers, and the recent ones who have brought back the Black Tepary from near genetic-oblivion. 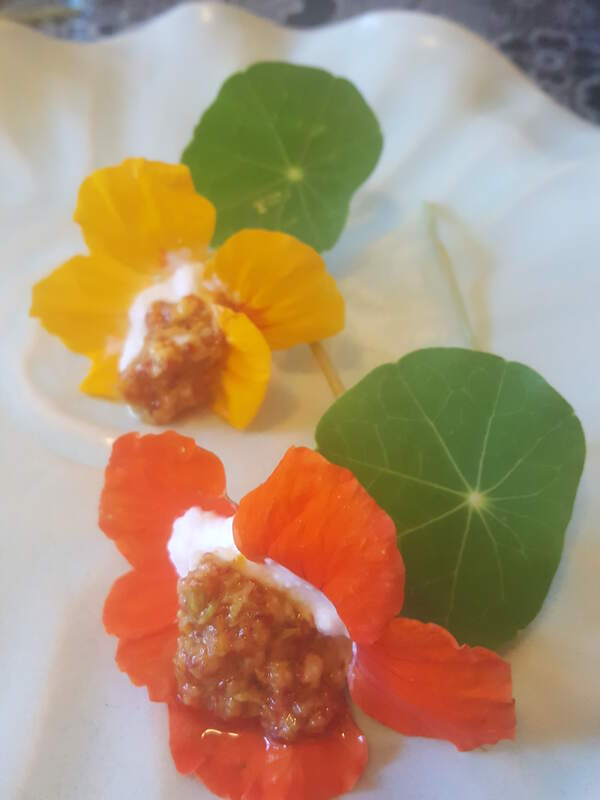 Coming this week to Tucson is a food event not to miss: the Farmer to Chef Connection, this Wednesday, September 16, at Tucson Community Center, 12:00noon-5:30pm, sponsored by LocalFirstArizona. Google their site for tickets and come enjoy a smorgasbord of local tastes. 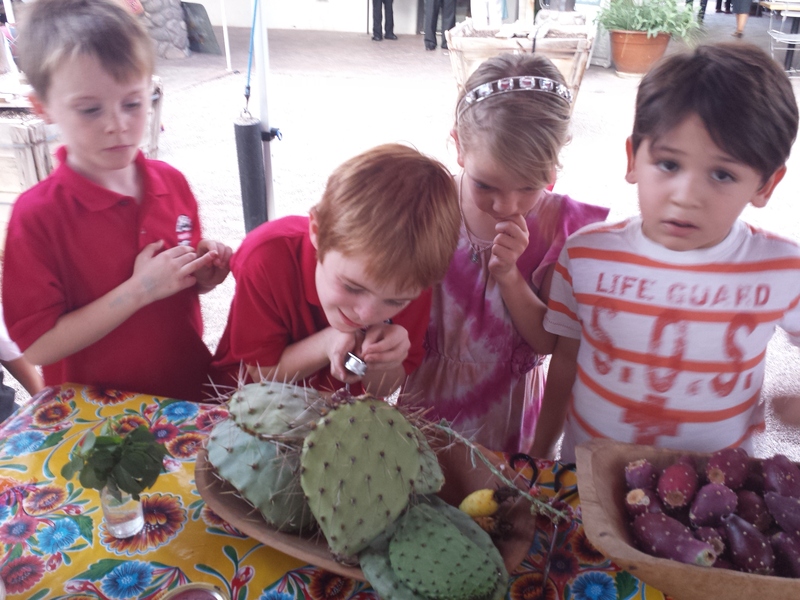 Also be sure to mark your calendar for October 18 and join NativeSeeds/SEARCH and Friends of Tucson’s Birthplace at the very heart of Tucson’s Birthplace –the Mission Garden at the base of A-Mountain—for the first-ever outdoor Farm to Table Picnic. It will be a feast to remember. Make reservations now and we’ll see you there for fun, flavor, history and friendship! Amy Valdes Schwemm here today, with glochids in my hands. “I want to be a scientist!” she said. Harvest party at Bean Tree Farm. 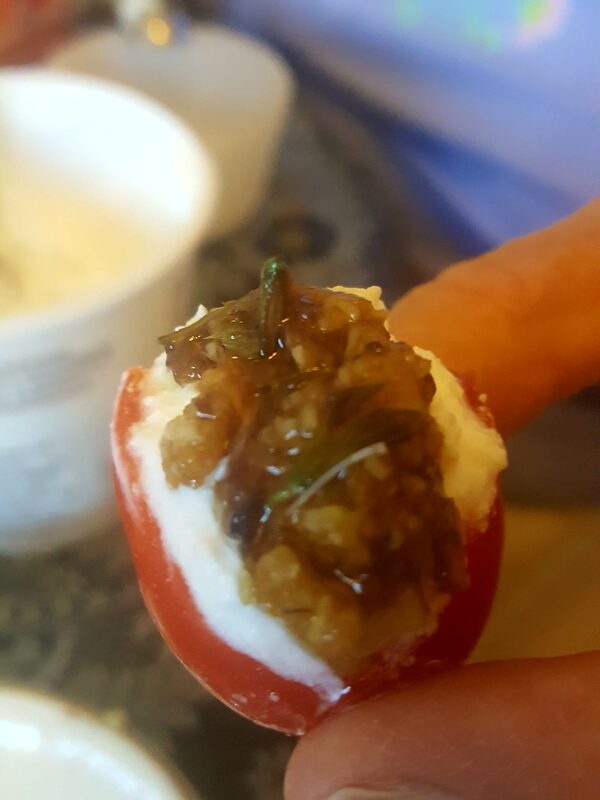 Fancy cocktail by Barbara Rose! Preheat oven to 325 degrees F. In a 9 inch springform pan, put 1/4 cup butter. Put pan in the oven just until butter is melted. 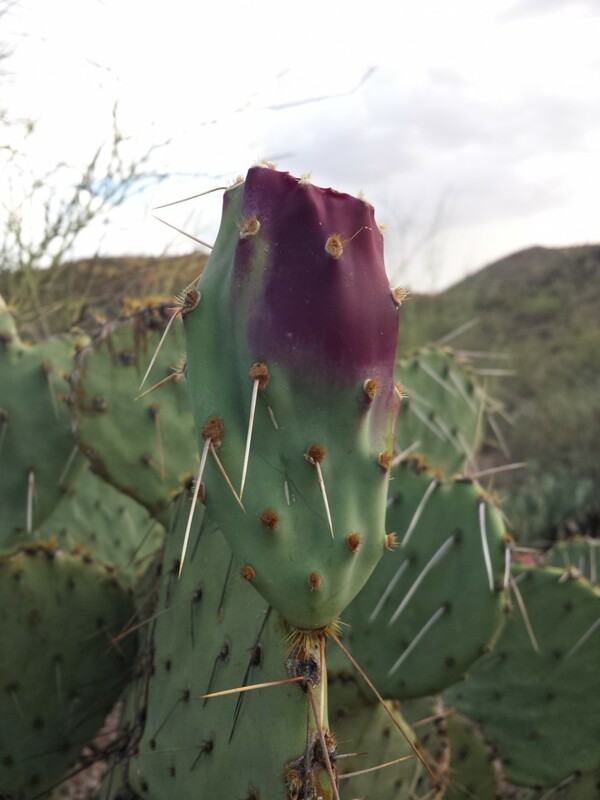 Sprinkle with brown sugar and arrange prickly pear fruit on top. Mix flours, sugar, baking powder and salt. 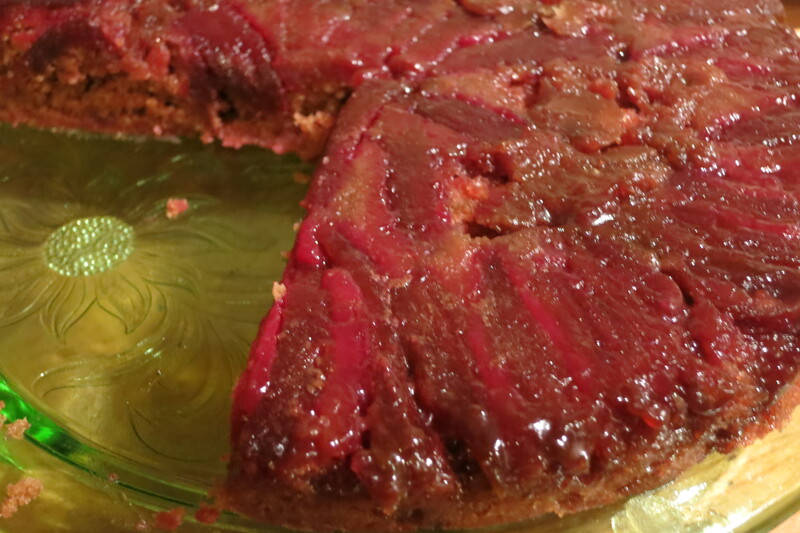 Separately, mix prickly pear juice, 1/2 cup melted butter and vanilla. Combine the two mixtures and pour into prepared pan. Bake for 3o minutes or until a toothpick inserted in cake comes out clean. I like the cake to have some brown edges. Cool, invert on to a serving plate and enjoy. Aunt Linda here: Happy February ! The peak of February’s very gorgeous very Full moon was Tuesday. Also easily visible with the naked eye, the planet Jupiter played flirtatiously around the moon for several days. Today’s blog offers a little parable. So pour yourself a cup of tea, coffee, or whatever you prefer, and travel with me. Once upon a time, during a moon such as this with Jupiter visible to the naked eye, in a land not so far away …. a pilgrim, or a seeker, or a soldier, or an emperor, or someone just like you and me, crested the peak of a mountain having finally found the Wise One. After many moons of seeking this particular Wise Person, the seeker arrives with high hopes of learning what they had so dearly yearned to learn. They were in Search of Answers. “Ah”, said the Wise One, “sit down and let us talk over some tea”. So, after warming the water and preparing tea, the Wise One began to pour the liquid into the cup of the One in Search of Answers. Until the tea cup overflowed. Spilling onto the table, the floor, the person. In some versions of the story, the more polite seeker, is startled, and exclaims: “Teacher! Perhaps you have not noticed that my cup is spilling over!”. In another version, the tea spilled onto the robes of the (not so polite) emperor, who becomes angry, chiding the Wise One for ruining his robes. In each version, the reply of the Wise One is the same: “There is no room in the mind of the seeker, for the wisdom he/she says he wants, and has searched for for so many years. Emptiness, whether mind or cup, is needed before new insights can be received”. Being filled with opinions, speculations, habits of mind, hinders the ability to take in of fresh insights/knowledge. Temple Grandin ran into this phenomena in the world of animal husbandry. Having discovered extremely practical wisdom about how to work with large animals more efficiently and calmly. She developed methods that significantly decreased the stress on both animal and human, and other methods that significantly increased efficiency. Her ideas were practical. Her ideas were “humane” and efficient . They offered ranchers and industry alike, to save money. And they were met with “full”-on resistance, if you pardon the pun. Rolling forward in time, the vast majority of ranchers, have integrated some if not all of her ideas of moving animals. 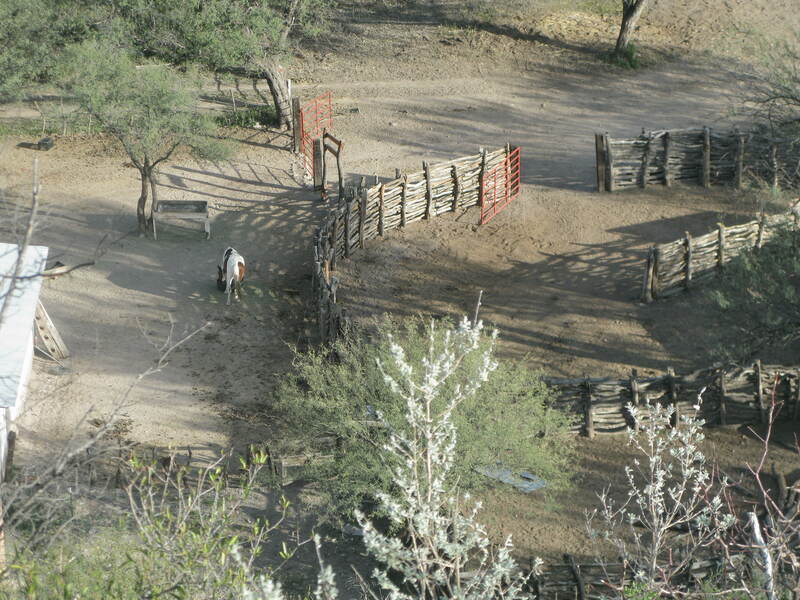 Corrals and shoots have been redesigned. Transportation trailers for horses were redesigned (diagonal facing not front facing) . It goes on and on. But before the “industry” could take in all this animal-human wisdom “it” had to empty It’s mind of preconceived ideas. We redesigned our corrals. No more box shapes with corners. Curves allow flight animals such as cows and horses to feel safer and move as they would in the field. On a personal level, when my mind is “full” of worry, I can sometimes miss the more innovative solutions available to me. Conversely, when I empty my mind enough, life gets easier. For me, “easier” is simply more practical. One example from the week: I discovered a nest of baby mice in the feed bin this week. I immediately felt stress. TO be clear, I am not “anti-mouse”. I am just “anti-TOO MANY MICE that it becomes unhealthy”. An occasional mouse is not uncommon around poultry, and the “girls” (the chickens themselves) or a king snake take care of them. Until recently, our cat was a good “mouser”, but she is 20 years old now and no longer on the job. So this issue of mouse nests is a new dilemma for me. I do not want unhealthy mouse droppings around the hens and eggs. I do not want mice eating the feed, and bugging the chickens all night long, as they nibble here and there. Follow the trail of mouse poop and you will be amazed at what acrobatics they are! I hate to use poison for a variety of reasons, one being fear that a predator such as a hawk or neighbors cat could be poisoned itself if it eats the bait-ridden mouse. And baby mice, despite knowing all of the above, are just so cute. I don’t Want to kill them! Adorable for sure, this nest of baby mice is nevertheless not welcome in the hen house. I was full -on- fretting. No space for innovative solutions to present themselves. Deciding to relax my mind, I went for a walk, switching mental channels from a litany of methods of killing mice, none of which I liked … to a question… How does Mother Nature do it? Mice have a plethora of babies, presumably because there are a plethora of animals that eat/need those mice. What eats mice? Snakes came to mind. ( Just as I am not anti-mouse, I am not anti-snake either. All have their place. It is BALANCE that I am looking for). I sent out a text (modern world) and within minutes had a Python present itself. Then another snake owner said she was looking for a good source of mice for her reptile. Later this afternoon, a litter of mice, will be delivered to a Python. And I will be rid of the “seed” stock of multiple generations of mice. Whether or not the snake-owners will raise the mice and feed them as needed, or freeze them for later feeding, I do not know. Stay posted. I Love the sensation(s) on my tongue as the cool of the mint in the frosting meets the heat of the chiltepin! And while it is my “go to” cupcake recipe all year long, it might be a Very fun Valentines Day treat, what with the Chocolate/Chile combination as well as the sensual mint-chile interaction. 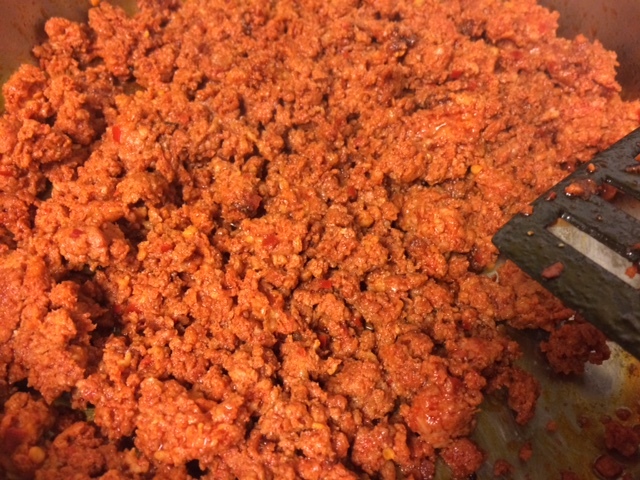 ¼ teaspoon dried and crushed chiltepins, seeds removed if desired. Preheat your oven to 350 degrees and line 12 cupcake cups with paper liners. Whisk together the milk and vinegar and in a large bowl and set aside to allow time to curdle. Once curdled, add the honey, oil, and vanilla extract and blend well. Sift the dry ingredients together and slowly add to the wet mixture, stirring between additions. Divide batter among the cups, filling each about ¾ full. Bake in preheated oven for 18-20 minutes. Once the cupcakes have cooled, you can frost them with the Cool/Hot Cream Cheese Frosting that you have made while the cake-lets were baking. 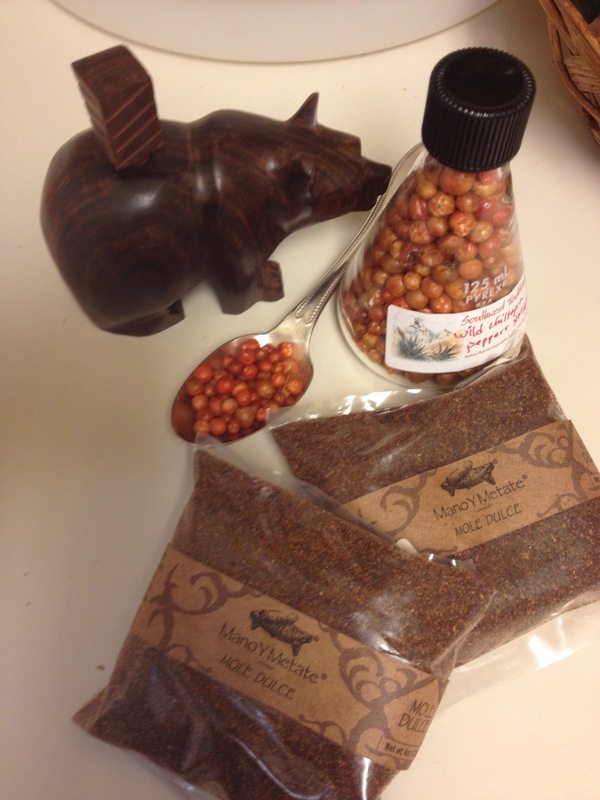 ¼ teaspoon dried and crushed chiltepins. 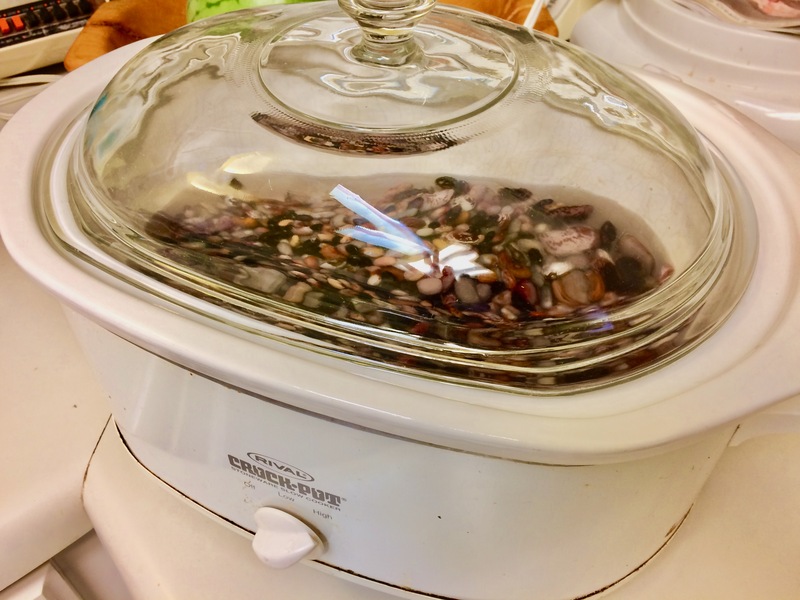 Note: leave seeds of you are going to eat promptly or want the heat to remain stable. Remove seeds if you will be eating frosting in a few days and do not want the “heat” to increase. 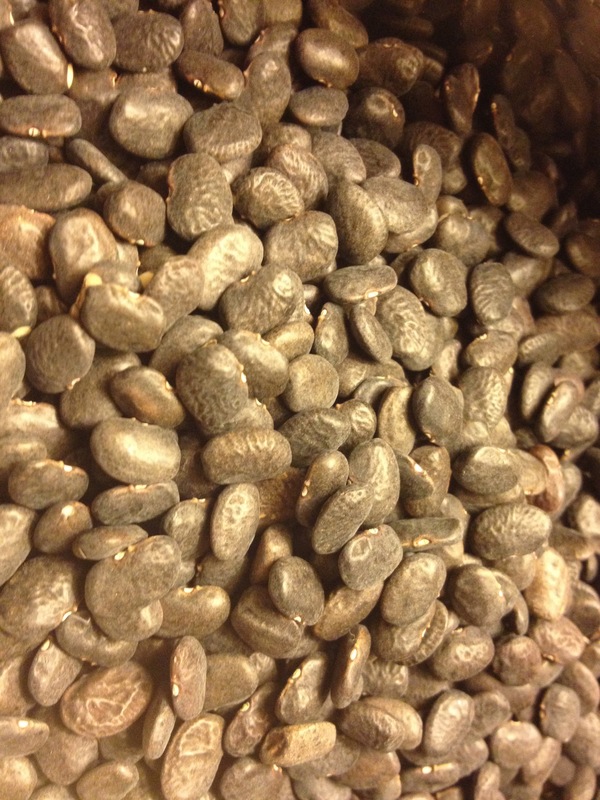 The “heat” from chile comes from the oils on the seeds, and with time, the heat will “grow”. Experiment and see what you prefer! Combine all the ingredients except the fresh mint in a food processor bowl and mix well until combined. Add just 1 tablespoom of milk to begin, adding the rest by teaspoons if you want to thin the mixture. Frost the cupcakes; top each cupcake with a small sprig of mint for an edible garnish. 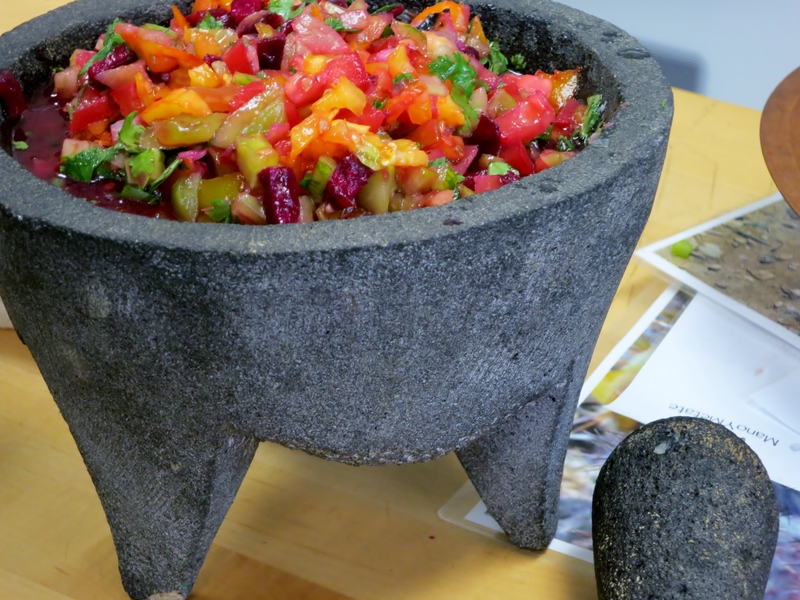 Naturally fermenting salsa makes a richer and more complex flavor than simply adding vinegar or lime juice, but it does take a little patience. I love tart salsas and sour foods with a bite. Grandma and Grandpa Schwemm on my dad’s side passed on a tradition of sauerkraut, and my mom’s family loves chile. How could chiles fermented like kraut not be my favorite food? 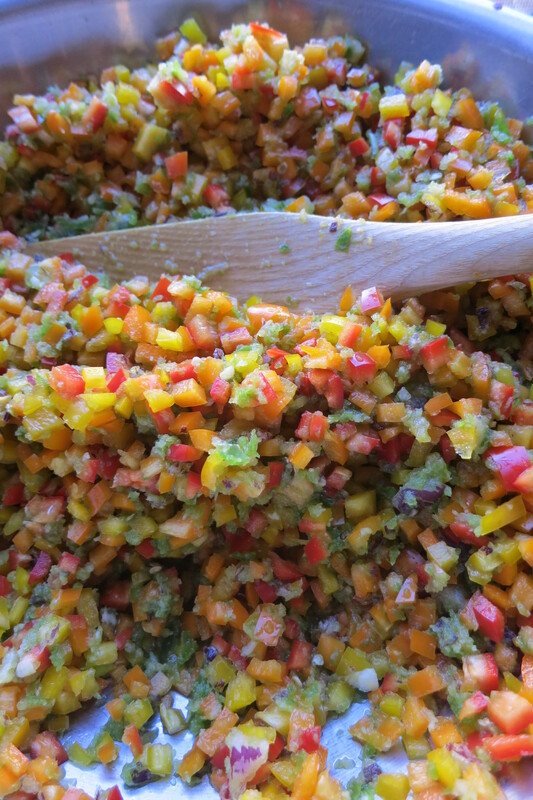 Fermented salsa is a source of pro-biotic microorganisms, recently rediscovered as essential for the digestive system. 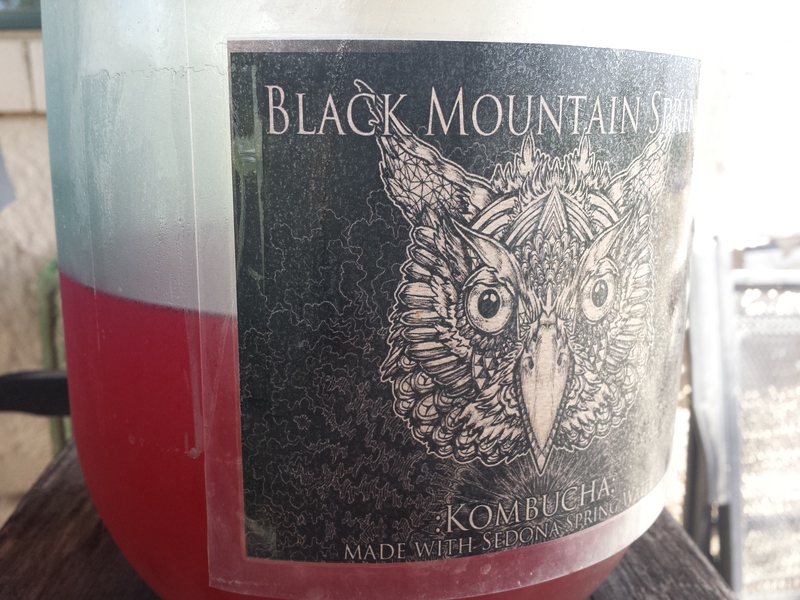 Home fermented foods probably provide more active and diverse cultures than what comes in a capsule at great expense. Chiles for this preparation can be fresh or roasted or even dried. 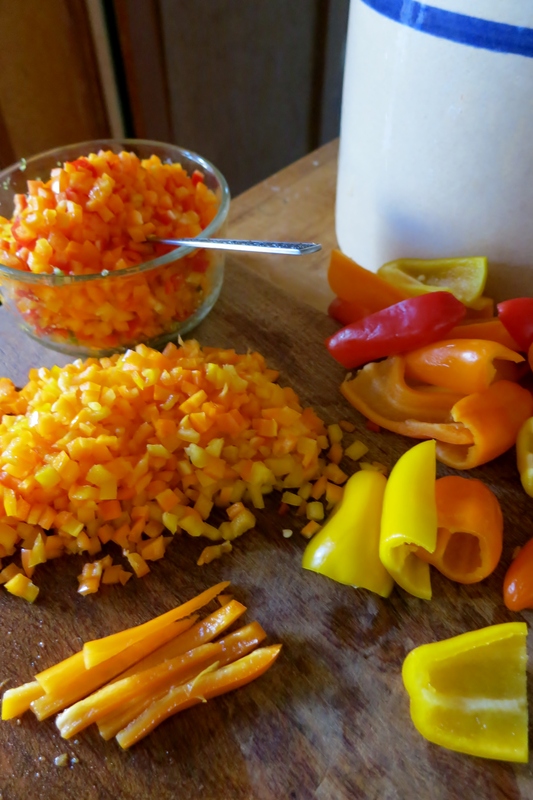 I’ve used everything from dried chiltepines to fresh Big Jims and sweet peppers. 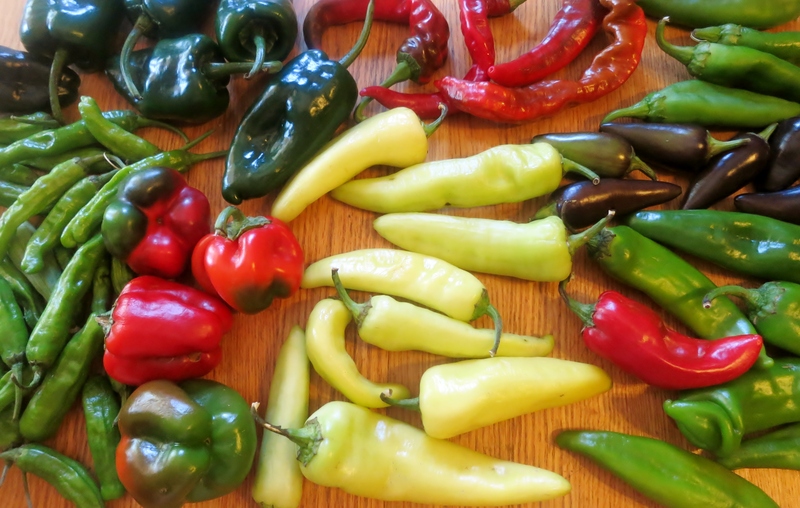 Hot, fleshy chiles like Jalapeño, Serrano, Guero, Wenks Yellow Hot, and Sinahuisa are ideal. 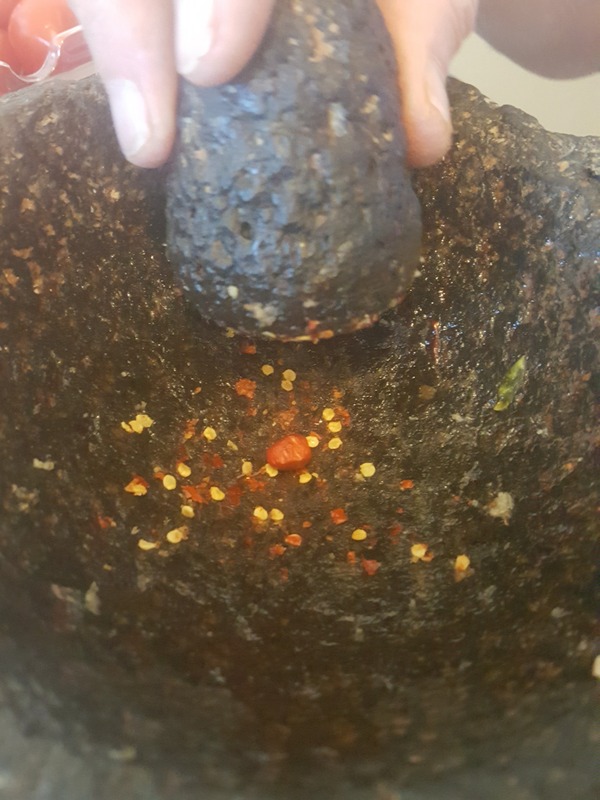 Sometimes I meticulously seed and dice the chiles, sometimes I only cut off the stems and coarsely chop in the food processor. I usually add onion, garlic and herbs, as the season and whim direct. 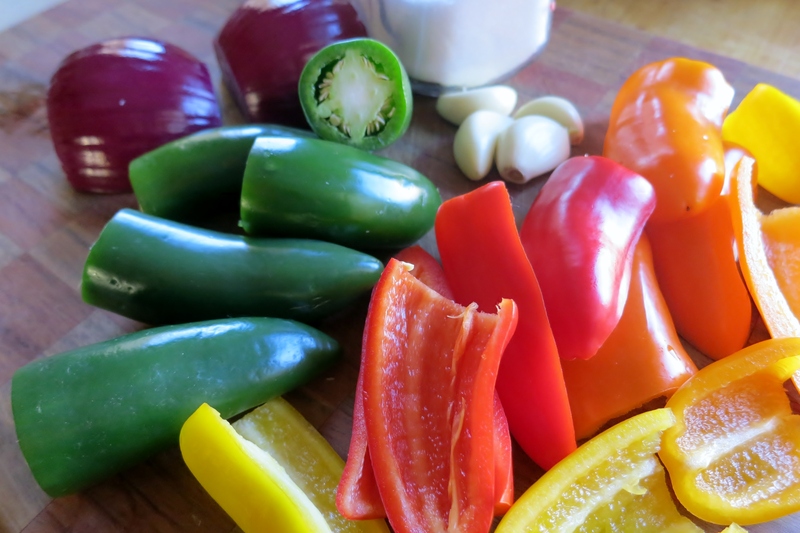 Add salt to the salsa, 2% of vegetables’ weight. This is roughly 1 teaspoon non-iodized salt per cup of diced vegetables, more or less. Salt slows and directs biological activity to make the food more delicious. Lactobacilli thrive in salty environments where other organisms cannot, and the lactic acid they make further inhibit harmful bacteria. Since this is a condiment, I don’t mind it a little salty. There are enough beneficial bacteria on the fresh produce and in the air, so no starter culture is necessary. If the chiles are not very fleshy or I want a thinner sauce, I add a little brine made with 2 teaspoons salt per cup of water. 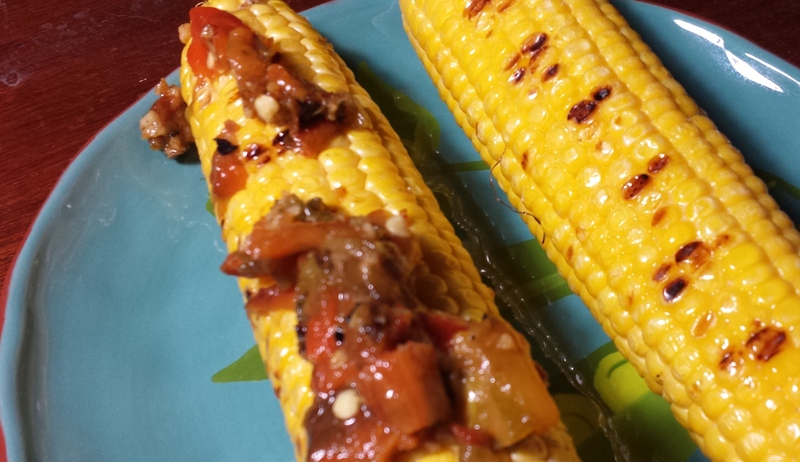 Thinning the sauce is a good idea when the chiles are very hot! 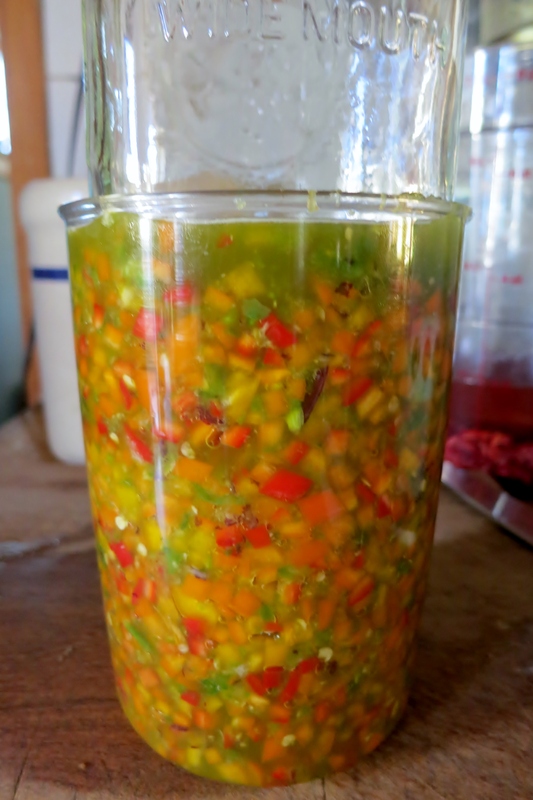 Put the salsa in a jar with a weight on top, keeping the pieces of chile submerged in exuded juice or brine. I use a smaller jar as a weight. 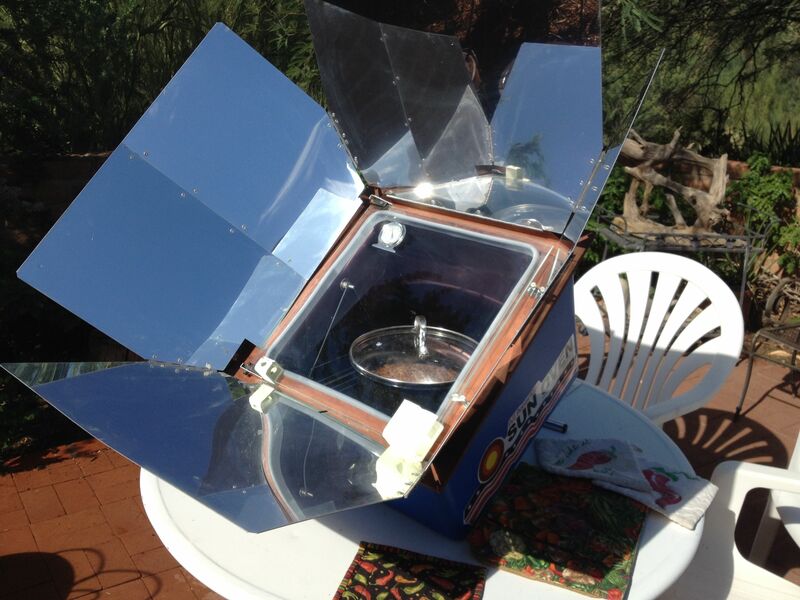 Cover the tower with a tea towel to keep out dust and insects, and keep at room temperature. How long before it’s ready? Test daily in warm weather to see if it is sour enough for your taste. In winter, the process is slower, taking up to a couple weeks. If white mold forms on the surface, skim off the top. It is harmless. If the mold is any color other than white, or below the surface of the liquid, discard the whole batch. Better safe than sorry. 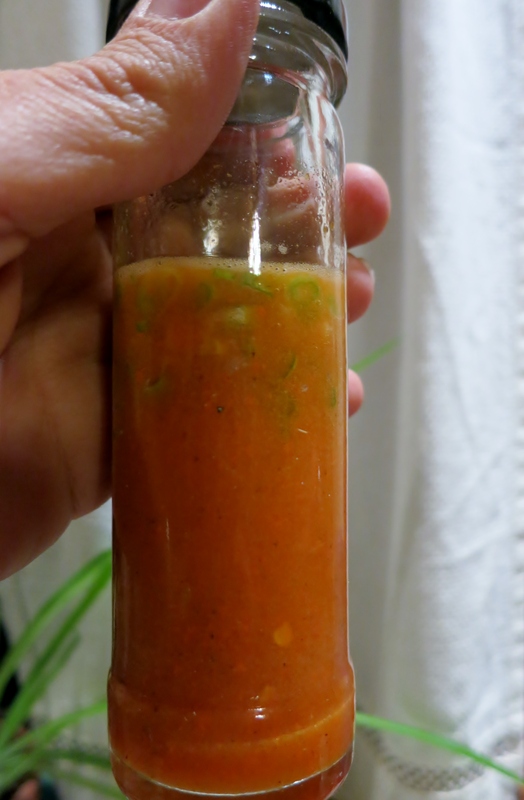 When the salsa is tart and delicious, it can be eaten as is or pureed. For a smooth salsa, it can be strained. Sometimes I add fresh herbs or minced I’itoi onion tops. 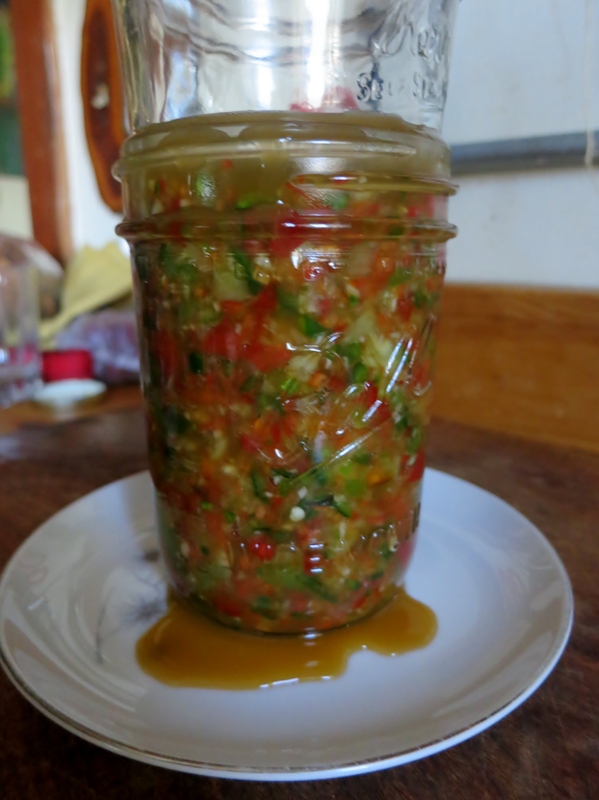 Store fermented salsa in the refrigerator with an airtight lid. 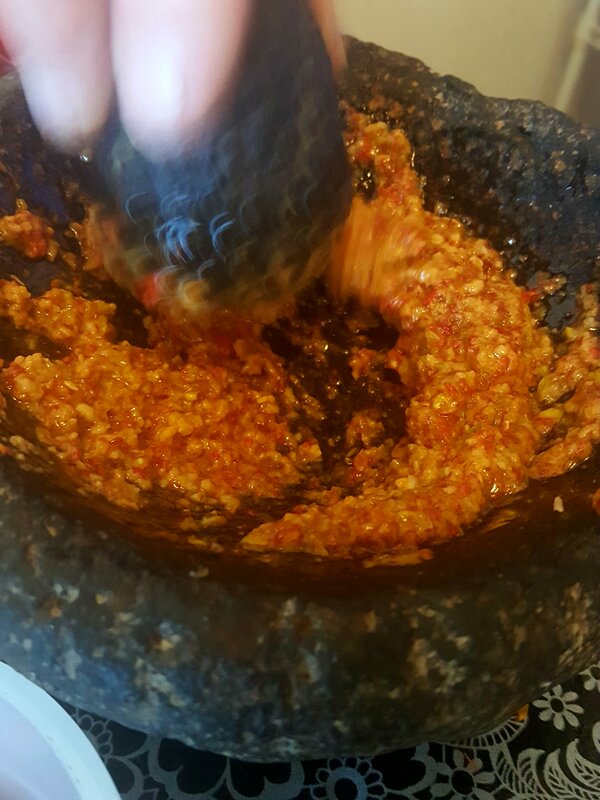 Chef Molly Beverly from Prescott, Arizona suggested fermenting a sauce from Mano Y Metate Pipian Rojo, so I have some of that going now. I can’t wait to taste it! 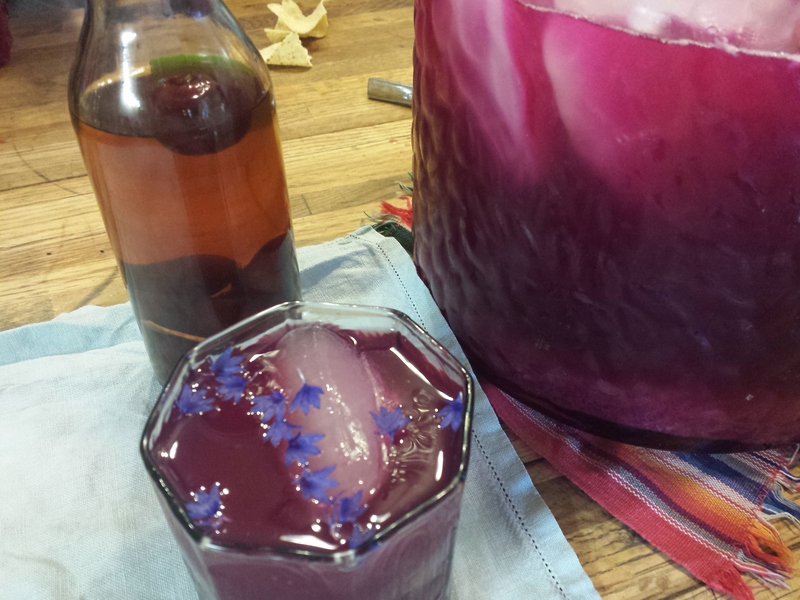 For more details about fermenting food, see Sandor Katz’s The Art of Fermentation. 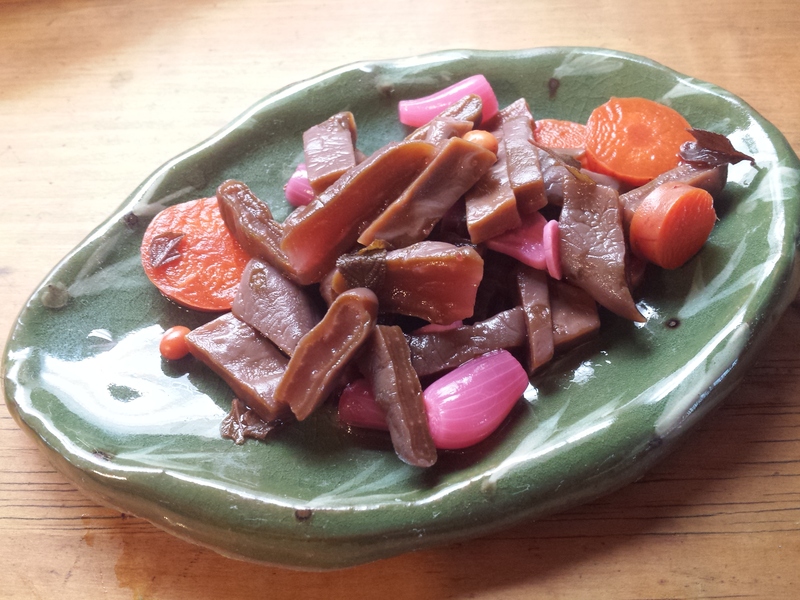 For an encouraging primer on safely fermenting food, find Wild Fermentation also by Katz. This is one of my all time favorite cookbooks. It is predawn in the Old Pueblo, summer constellations flicker overhead, the early morning mating songs of birds twirl their way to my ears. Right now the air cool and dry. In a matter of hours it will heat up to triple digits. Those who live in the desert a resilient sort. We live with significant temperatures swings all year long, fascinating animals (I saw a Gila Monster June 1st), and lots of spiny cacti, all of which we find beauty in. I like my food to be resilient as well. Which makes me think of pie. It can be savory or sweet., or both. It can be served hot or cold. It is forgiving in what it allows the pie maker to do. It can be frivolous or serious; nutritious or not. Its flavors can reflect family and cultural identities and preferences. Pie does it all. Which makes me curious about who the First Pie Maker might have been. The particular “who” remains a mystery. After reading up on pie, it seems to me that there were likely many many many First Pie Makers in nearly every culture known to cook and experiment with food. It is, after all, quite simple: the creating of dough, or pastry, and then filling it with regional, seasonal foods. The First Pie Maker was not a Southern American, despite many Americans strong cultural identity about pie. 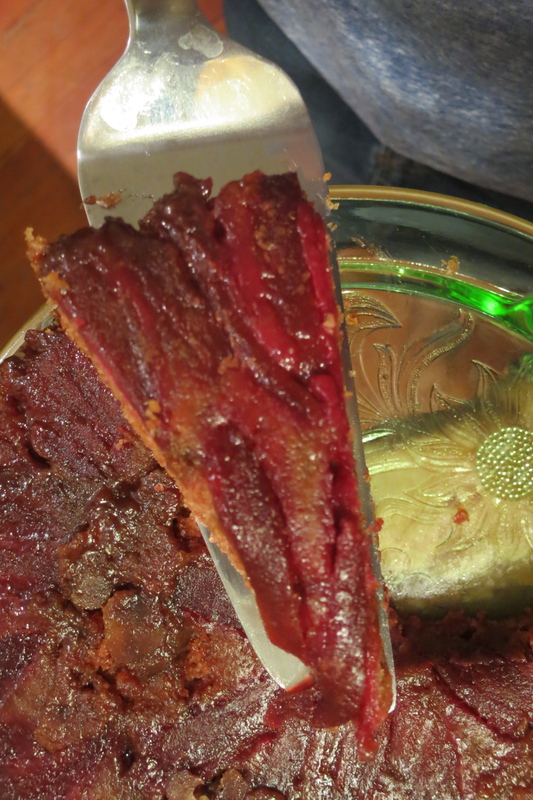 Read even a little bit about pie and you quickly find intensely personal accolades about it. For those who “get” pie, there is a love for it that is both reverential and sensuous. It includes a deep feeling of being “nurtured”, pie often being equated with Grandma’s Love. It is clear that human beings have been feeling nurtured by what we now refer to as pie, for a lot longer than the United States has been a country. One first version of pie, came from Egypt, around 9500 B.C. That surprised me. It places the first pies all the way back to the Neolithic Period. 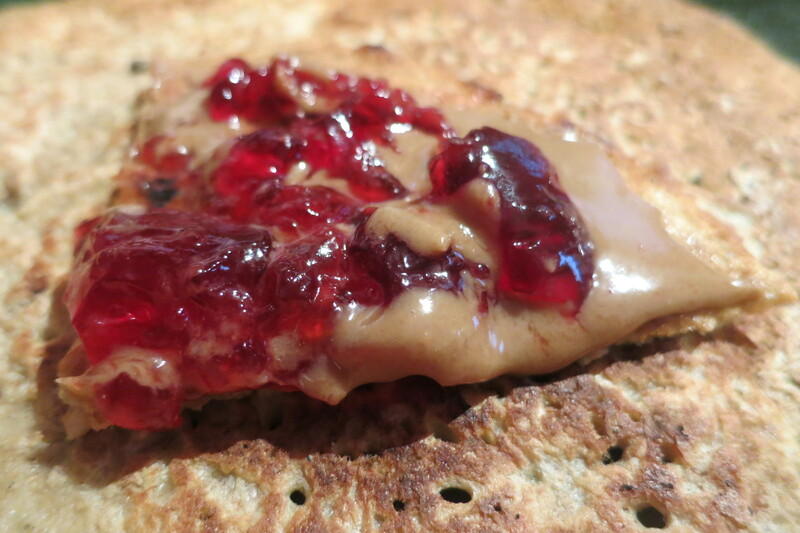 The rustic pies were made from dough made from oat, rye, barley, and wheat – and then filled them with honey! The pies were then baked over hot coals. There is no doubt in my mind that their flavor was fabulous – what with the sweet of the honey and the smoky taste of having been naked in coals. By the time the Pharoh’s bakers got into the action (by 1300 BC-1200-something BC) nuts and fruits were added to the honey “pies”. Ramsey the II’s tomb shows etchings of this. The beekeeper in me loves this! Remember that the Egyptians were prolific beekeepers, floating their hives up and down the Nile to follow the honey flows. As epochs continued, and cultures evolved the fillings included meats of all kind, as well fish, muscles, and oysters; dairy products became another beloved filler. Human are creative and the number and variety of pies world wide is enormous. They include Indonesia’s “panada”;, Jamaica’s “patty” Malasia’s Keripap (curry puff), Nigeria’s “meat pie” and on and it goes. Throughout Latin America and Mexico you find the Empanada. Sweet meat emapanadas are made for Christmas in Mexican tradition.. At the ranch, we make Calabasa (squash) with Pilloncillo (a brown cane sugar) Calabasas. As much as I value a good, slow cooked meal, it is just too hot in Tucson presently to be near heat for very long. So I decided to try to create a version of pie that was smaller and thus quicker to bake. It is also more portable. And infinitely flexible: you can eat them warm or cool, pack them for a hike, lunch, bike or car trip, kids lunch. They can be fancy, humble, or decadent. Create great tasting pies from foods you are most passionate about. Create them from leftovers. The two photos above show you how versatile the ingredients can be. All you need in the way of equipment for these joyous little pies is a standard 12 cup, muffin pan and some parchment cupcake-paper inserts for your muffin pan. +++ Pie Dough or Pie Crust of your choice. Make the favorite family recipe. Investigate a new one. There are a plethora of recipes available in these food savy days, vegan options, full fat ones, raw ones. I used a store bought crust for these tiny pies. While I have made crust in the past, and value making it, I needed something quicker this week. There are a number of buying options these days. I found one at my local health food store, whose ingredients I felt comfortable with. I feel dough-headed (brain fog) and lethargic if I eat a lot of dough, so I minimized it in these recipes – but you can and should use as much or as little as your would like. Fill the sides! Cover the tops (remember to slice air holes). Add decorations with the left over dough. Remember resilience, and you can practice it in the act of making pies. I used the equivalent of 1, 9″ pie crust; but if you would like to have more pie crust to the pies, make enough for two 9″. Also, using the parchment is completely optional. I used it because I travel a lot and I thought the pies would travel better, too. I think the tiny pies might be more beautiful for your table if you don’t use the paper, and if you use dough for the whole pie, including sides and top. 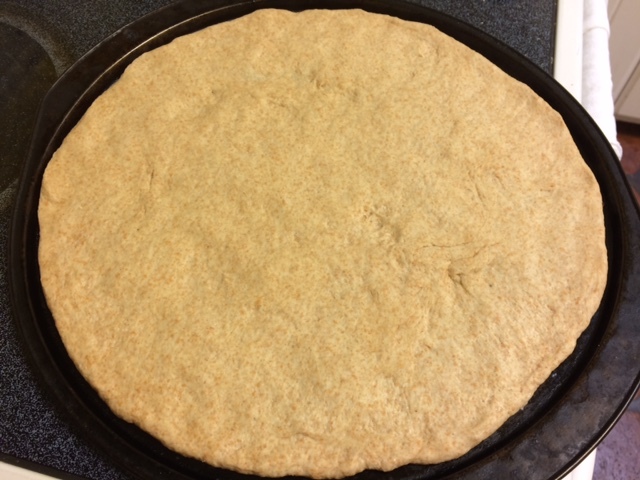 In that case, after unrolling your dough (you’ll do this whether you make it yourself or buy it), place it on a lightly flowered surface, and roll with a rolling pin, to about 1/8′. Using a biscuit or cookie cutter cut 12, 4” circles for the bottom of the pie and 12, 3″ circles for the top, or for as many pies as you would like to make. +++ Imagination and Play-full-ness as you select your Other Ingredients. We humans can be a tad on the serious side. Too much seriousness undermines resiliency. A spirit of play help us strengthen resilience. So allow your spark to guide you, as I did in the New World Pie above. Place the muffin parchment papers in the muffin tins, or gently handling the dough, press dough into the muffin cups. 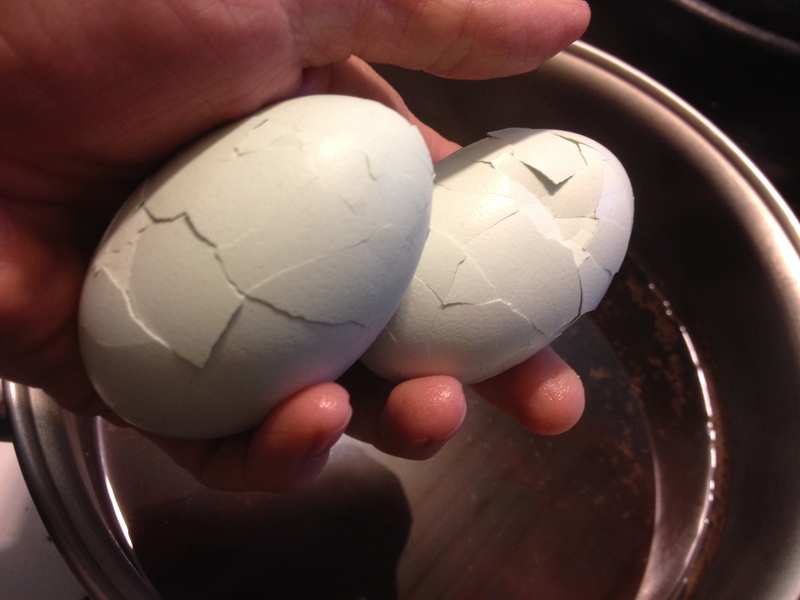 Break the 3 eggs into a small bowl (preferably one with a pouring spout) and beat with a fork until combined. Divide your ingredients to the bottom crusts, and then pour about two tablespoons of the egg to the pie. Add the top crust, or weave a top crust. Once you have the pies filled, and topped with crust, refrigerate the muffin tin for 30 minutes. Preheat Your oven to 375 F – and when the small pies have sufficiently chilled, bake them for 20-30 minutes. The time will vary from oven to oven, and from the types of pies. 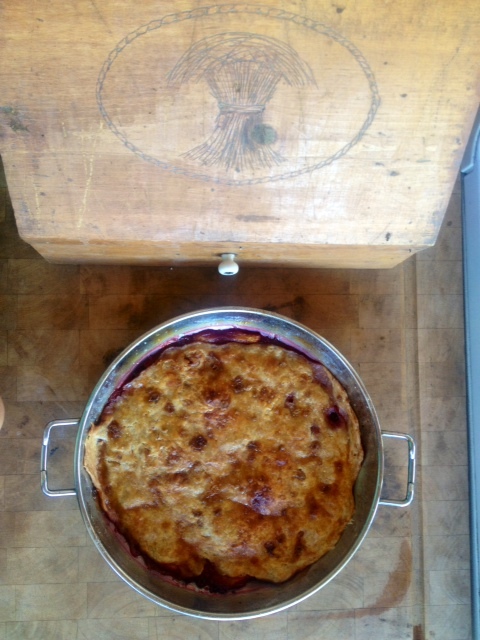 For the New World Resiliency Pie, I added prickly pear, chilpetin cheese (see my January post for the recipe), and the 2 T of beaten egg. I then tried a New World Dessert Pie – and filled the pie with Chocolate and Chiltpein Cheese (like a French pastry, but with the chile cheese). Note there is crust just at the bottom. The “before” baking Portable Pies – you can see the pirckly pear pads peeking through. The “after” photo is at the top of this post. I was surprised how VERY fun it was to think up names for pies! Feel free and post some of your pie variations and names! Tia Linda: Spring seems to be arriving early in the desert, again, this year and egg laying is increasing significantly among my birds. 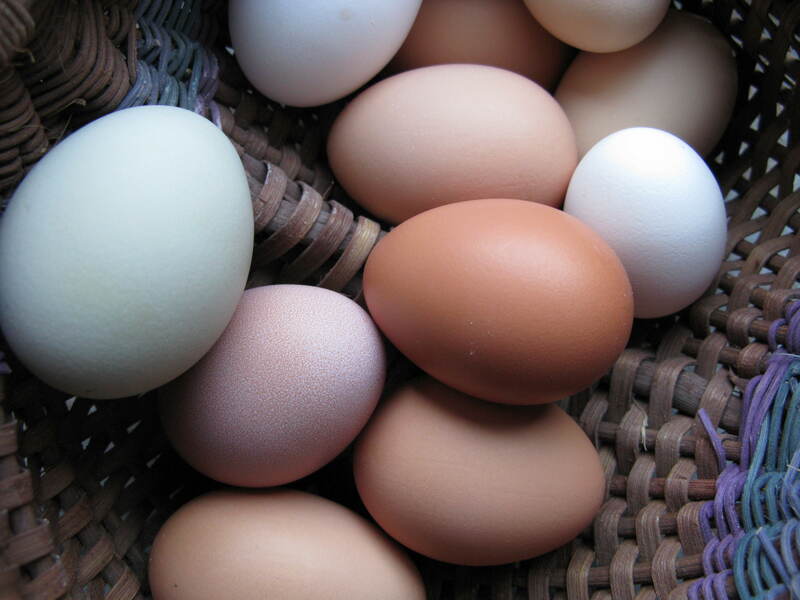 It is less a function of temperature than it is the increase in light to the pituitary glad that increases egg laying. And my hens are broody, feeling strongly the impulse to sit upon and incubate eggs. Broodiness is a trait to be cherished in your birds. This is a great time of year (here in the Southwest) for the poultry aficionado to begin preparing for a new batch of chicks. 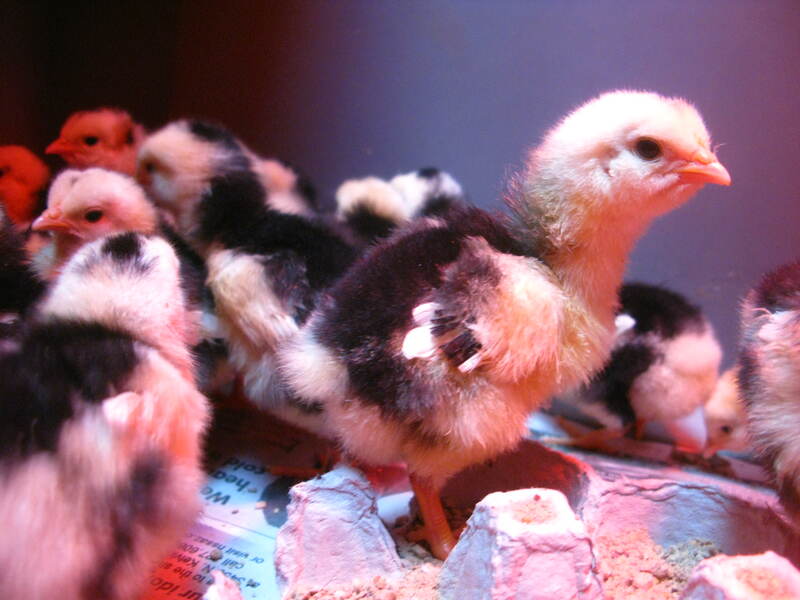 In fact, it is not too early to have a eggs under a hen or in your incubator already. 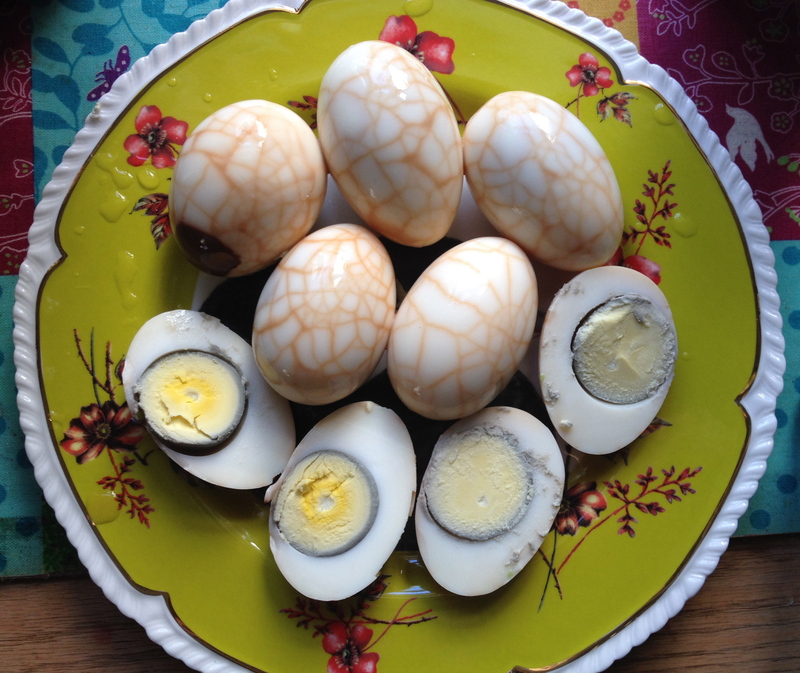 For me, eggs have properties that go beyond being beautiful and nutritious. I feel more whole when I am collecting eggs; more in touch with Cycles. Aesthetically, they arrive in surprising varieties of oval shapes, sizes and colors. 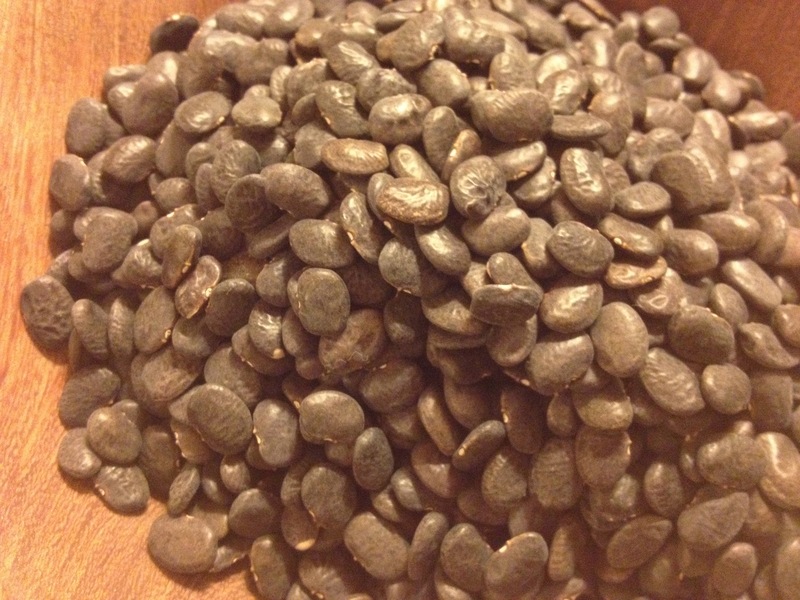 Nutritionally, they are chock full of minerals, are good for eyesight, and are a great source of (affordable) protein. In Michael Pollan’s book COOKED, he cites research from 2011, that states “ninety percent of a cooked egg is digested, where as only 65 percent of a raw egg” (Page 61n). Whether or not you are raising chicks, today’s recipe is a fun way to cook your eggs to get the most nutrition – and beauty- out of them. But, before we get to the recipe. Many cultures across time and space celebrate the egg. A few (painfully truncated) myths that include the egg show this. I sense a theme arising here. Cracks. And Creation. They seem to have something to do with one another. Whether or not your believe myths to be literal or metaphorical, an explanation of mystery or a reflection of the human psyche, is yours to decide. Regardless, we can act as creators within our own pots and kitchens, and enjoy where the cracks take us. In our lives, “the cracks” are often involuntary and unasked for. Often, it is only later that we realize that it is these very cracks that allow some needed shift or change to occur. With this recipe we can actively crack some shells. Let in some flavor. Some color. Create some beauty, all while being nourished. Put 8-10 eggs in a pot and begin to hard boil them. While you are doing this, begin making a tea/spice bath for the eggs to go into after boiling. I use a handful of whatever tea I particularly like at the moment (or 3-4 teabags if you prefer). Lately I have been using black tea, but have also experimented with oolong and green teas. 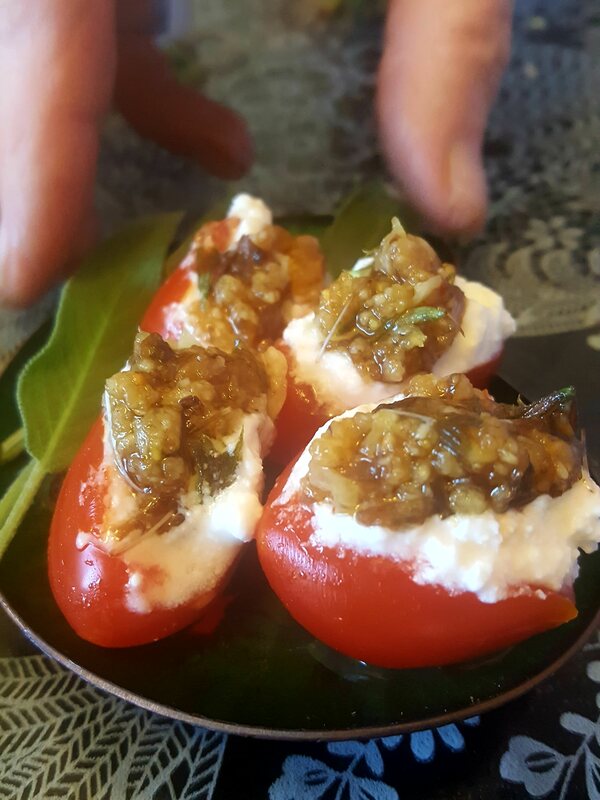 Experimentation is the key, and you, being the creator, can shift and change your recipe as you like. 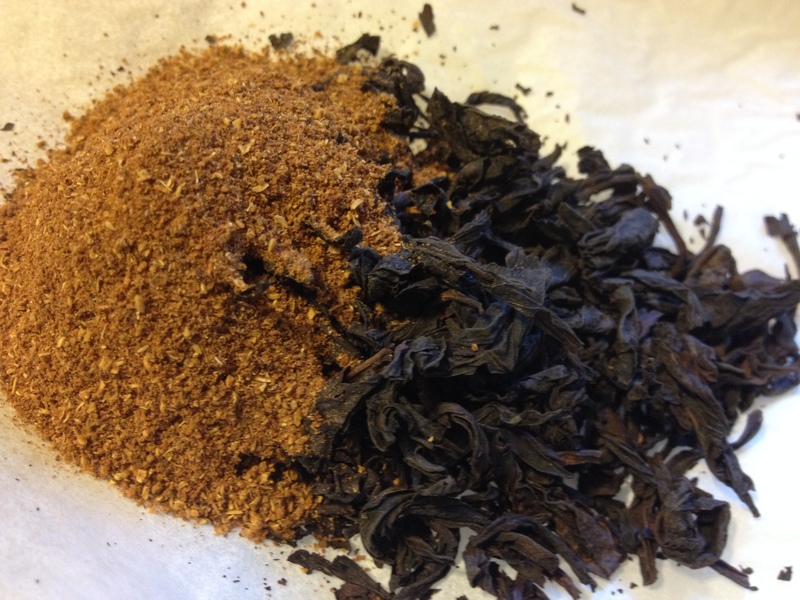 To the tea, I add about three tablespoons of Chinese Five Spice. This is the basic recipe. 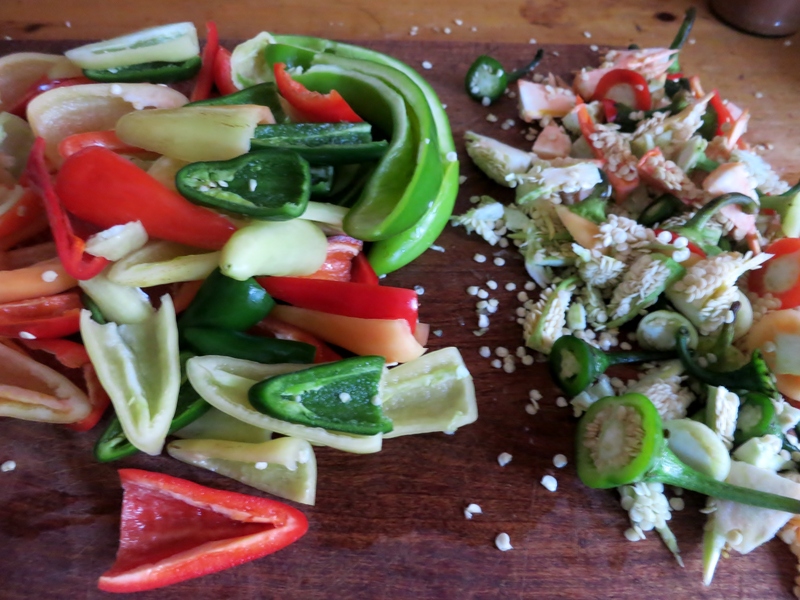 To this basic recipe you can add, fresh ginger (chopped) and/or some chile (I use chiltepin). Whatever spices that want to play on our tongue are the ones to use. Remember you are the creator, and the choice of spices and how you use, is completely up to you. 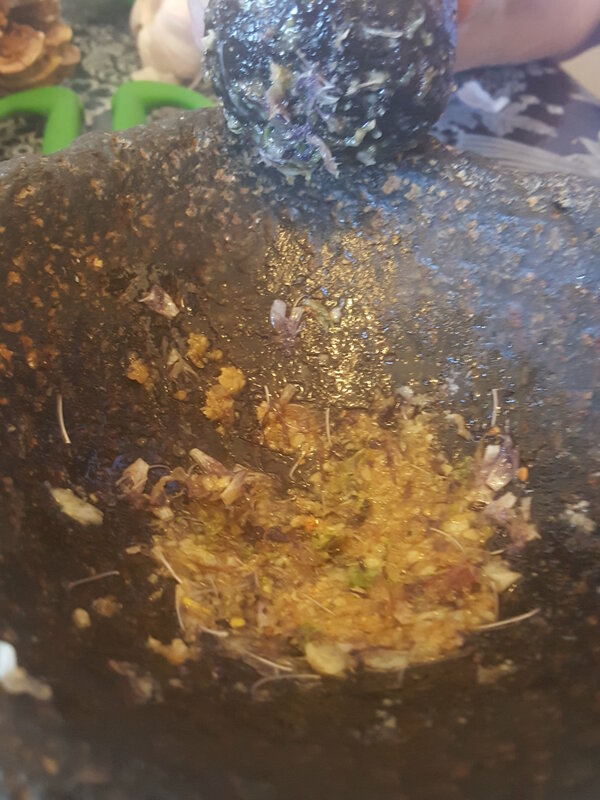 The tea and spice mixture, dry. Place the tea and spice mixture in another pot, and add enough water to just cover the cracked eggs. Peel and enjoy both their beauty and flavor. 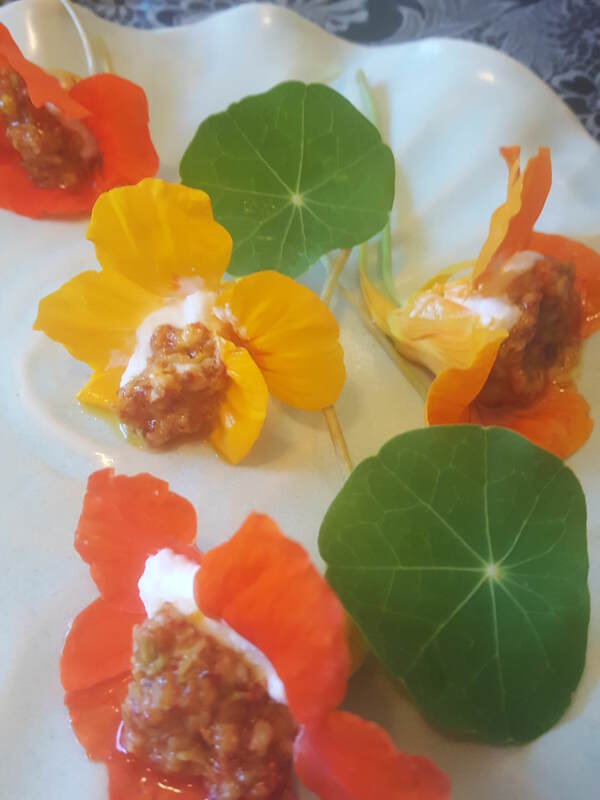 I included this photo to inspire you, as well as to show that if you peel off chunks of the shell you can create darker patterns (and deeper flavor), as in the egg top left. 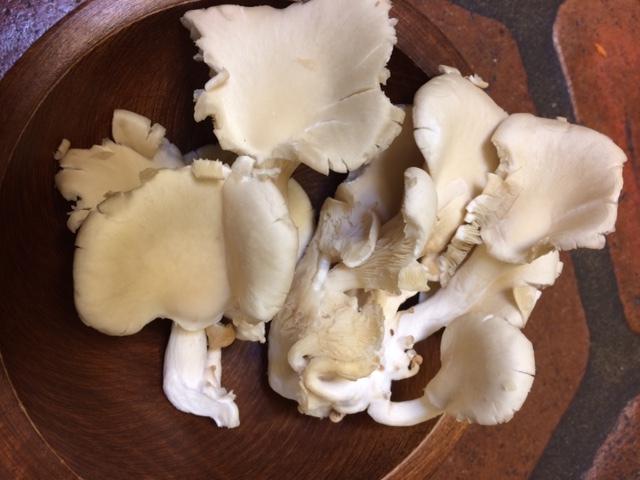 These also make a great egg salad, as they impart a great flavor. If you do not eat them all right away, store the eggs in a glass jar, in the tea bath water (strain out the spices/tea), in the refrigerator.